Jesus physical suffering started at Gethsemane. Though very rare, the phenomenon of Hematidrosis, or bloody sweat, is well documented. This process might well produce marked weakness and possible shock. Jesus is brought before the Sanhedrin and Caiphus, the High Priest; He is spat upon and struck in the face. In the early morning, battered and bruised, dehydrated, and exhausted from a sleepless night, Jesus is taken to Pontius Pilate and Pilate condemns Jesus to scourging and crucifixion. Preparations for the scourging were carried out when the Prisoner was stripped of His clothing and His hands tied to a post above Jesus is whipped with a flagrum. This is a short whip consisting of several heavy, leather thongs with two small balls of lead attached near the ends of each. The heavy whip is brought down with full force again and again across Jesus' shoulders, back, and legs. At first the thongs cut through the skin only. Then, as the blows continue, they cut deeper into the subcutaneous tissues, producing first an oozing of blood from the capillaries and veins of the skin, and finally spurting arterial bleeding from vessels in the underlying muscles. The small balls of lead first produce large, deep bruises which are broken open by subsequent blows. Finally the skin of the back is hanging in long ribbons and the entire area is an unrecognizable mass of torn, bleeding tissue. The Roman soldiers throw a robe across His shoulders, place a stick in His hand, and a crown make of branches covered with long thorns is pressed into His scalp. Again there is copious bleeding, the scalp being one of the most vascular areas of the body. After mocking Him and striking Him across the face, the soldiers take the stick from His hand and strike Him across the head, driving the thorns deeper into His scalp. Finally, the robe is torn from His back. Already having adhered to the clots of blood and serum in the wounds, its removal causes excruciating pain, and almost as though He were again being whipped the wounds once more begin to bleed. The heavy patibulum of the cross is tied across His shoulders. In spite of His efforts to walk erect, the weight of the heavy wooden beam, together with the shock produced by copious blood loss, is too much. He stumbles and falls. The rough wood of the beam gouges into the lacerated skin and muscles of the shoulders. Simon of Cyrene is commanded to carry the cross. Jesus follows, still bleeding and sweating the cold, clammy sweat of shock, until the 650 yard journey from the fortress Antonia to Golgotha is finally completed. Jesus quickly thrown backward with His shoulders against the wood. The legionnaire feels for the depression at the front of the wrist. He drives a heavy, square, wrought-iron nail through the wrists and deep into the wood. Nails driven through the palms will strip out between the fingers when made to support the weight of the human body. Anatomists, both modern and ancient, have always considered the wrist as part of the hand. The left foot is now pressed backward against the right foot, and with both feet extended, toes down, a nail is driven through the arch of each, leaving the knees moderately flexed. The Victim is now crucified. As He slowly sags down with more weight on the nails in the wrists excruciating pain shoots along the fingers and up the arms to explode in the brain -- the nails in the wrists are putting pressure on the median nerves. As He pushes Himself upward to avoid this stretching torment, He places His full weight on the nail through His feet. Again there is the searing agony of the nail tearing through the nerves between the metatarsal bones of the feet. At this point, as the arms fatigue, great waves of cramps sweep over the muscles, knotting them in deep, relentless, throbbing pain. With these cramps comes the inability to push Himself upward. Hanging by his arms, the pectoral muscles are paralyzed and the intercostal muscles are unable to act. Air can be drawn into the lungs, but cannot be exhaled. Jesus fights to raise Himself in order to get even one short breath. Finally, carbon dioxide builds up in the lungs and in the blood stream and the cramps partially subside. Spasmodically, he is able to push Himself upward to exhale and bring in the life-giving oxygen. 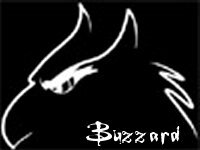 Hours of limitless pain, cycles of twisting, joint-rending cramps, intermittent partial asphyxiation, searing pain where tissue is torn from His lacerated back as He moves up and down against the rough timber. Then another agony begins...A terrible crushing pain deep in the chest as the pericardium slowly fills with serum and begins to compress the heart. It is now almost over. The loss of tissue fluids has reached a critical level; the compressed heart is struggling to pump heavy, thick, sluggish blood into the tissue; the tortured lungs are making a frantic effort to gasp in small gulps of air. The markedly dehydrated tissues send their flood of stimuli to the brain. Finally, Jesus cries, "Father! Into thy hands I commit my spirit." The common method of ending a crucifixion was by crurifracture, the breaking of the bones of the legs. This prevented the victim from pushing himself upward; thus the tension could not be relieved from the muscles of the chest and rapid suffocation occurred. The legs of the two thieves were broken, but when the soldiers came to Jesus they saw that this was unnecessary. Apparently to make doubly sure of death, the legionnaire drove his lance through the fifth interspace between the ribs, upward through the pericardium and into the heart, "And immediately there came out blood and water." That is, there was an escape of water fluid from the sac surrounding the heart, giving postmortem evidence that Jesus died not the usual crucifixion death by suffocation, but of heart failure due to shock and constriction of the heart by fluid in the pericardium. Even if Jesus did not die from crucifixion and "giving up His spirit", he would have been dead after His side being pierced. The procedure of crucifixion may be summarized as follows. The patibulum was put on the ground and the victim laid upon it. Nails, about 7 inches long and with a diameter of 1 cm ( roughly 3/8 of an inch) were driven in the wrists . The points would go into the vicinity of the median nerve, causing shocks of pain to radiate through the arms. It was possible to place the nails between the bones so that no fractures (or broken bones) occurred. Studies have shown that nails were probably driven through the small bones of the wrist, since nails in the palms of the hand would not support the weight of a body. In ancient terminology, the wrist was considered to be part of the hand. (Davis) Standing at the crucifixion sites would be upright posts, called stipes, standing about 7 feet high (Edwards). In the center of the stipes was a crude seat, called a sedile or sedulum, which served a support for the victim. The patibulum was then lifted on to the stipes. The feet were then nailed to the stipes. To allow for this, the knees had to be bent and rotated laterally, being left in a very uncomfortable position. The titulus was hung above the victim's head. There were several different types of crosses used during crucifixion. In Jesus' time, it was most likely that the cross used was a T shaped (or tau cross,), not the popular Latin, or t shaped cross which is accepted today (Lumpkin). Having suffered from the beatings and flogging, Jesus suffered from severe hypovolemia from the loss of blood. The verses above describe His dehydrated state and loss of His strength. With the sin of the world upon Him, Jesus suffered spiritual death (separation from the Father ). Isaiah 59:2 says that sins cause a separation from God, and that He hides His face from you so that He does not hear. The Father must turn away from His Beloved Son on the cross. For the first time, Jesus does not address God as His Father. Shallowness of breathing causes small areas of lung collapse. Decreased oxygen and increased carbon dioxide causes acidic conditions in the tissues. Fluid builds up in the lungs. Makes situation in step 2 worse. Heart is stressed and eventually fails. "...it appears likely that the mechanism of death in crucifixion was suffocation. The chain of events which ultimately led to suffocation are as follows: With the weight of the body being supported by the sedulum, the arms were pulled upward. This caused the intercostal and pectoral muscles to be stretched. Furthermore, movement of these muscles was opposed by the weight of the body. With the muscles of respiration thus stretched, the respiratory bellows became relatively fixed. As dyspnea developed and pain in the wrists and arms increased, the victim was forced to raise the body off the sedulum, thereby transferring the weight of the body to the feet. Respirations became easier, but with the weight of the body being exerted on the feet, pain in the feet and legs mounted. When the pain became unbearable, the victim again slumped down on the sedulum with the weight of the body pulling on the wrists and again stretching the intercostal muscles. Thus, the victim alternated between lifting his body off the sedulum in order to breathe and slumping down on the sedulum to relieve pain in the feet. Eventually , he became exhausted or lapsed into unconsciousness so that he could no longer lift his body off the sedulum. In this position, with the respiratory muscles essentially paralyzed, the victim suffocated and died. Due to the shallow breathing, the victim's lungs begin to collapse in small areas causing hypoxia and hypercarbia. A respiratory acidosis, with lack of compensation by the kidneys due to the loss of blood from the numerous beatings, resulted in an increased strain on the heart, which beats faster to compensate. Fluid builds up in the lungs. . Under the stress of hypoxia and acidosis the heart eventually fails. There are several different theories on the actual cause of death. One theory states that there was a filling of the pericardium with fluid, which put a fatal strain on the ability of the heart to pump blood (Lumpkin). Another theory states that Jesus died of cardiac rupture". Another says the cause of Jesus' death "may have been multifactorial and related primarily to hypovolemic shock, exhaustion asphyxia and perhaps acute heart failure" (Edwards). A fatal cardiac arrhythmia may have caused the final terminal event. The average time of suffering before death by crucifixion is stated to be about 2-4 days. There are even reported cases where the victims lived for 9 days. Jesus died a relatively quick physical death. In fact, Pilate was surprised that He had died so soon (Mark 15:44). While many of the physical signs preceding death were present, Jesus did not die from physical causes. Jesus gave up His life of His own accord. All of the final statements that Jesus makes on the cross leave one with the impression that Jesus chose His time to die. His last statement, "Into your hands I commit my Spirit" shows that Jesus' death occurred by giving Himself up. John's gospel records Jesus' death in this way: "With that He bowed His head and gave up His spirit" (John 19:30). Matthew writes: "And when Jesus had cried out again in a loud voice, He gave up His spirit" (Matthew 27:50). Earlier in Jesus' ministry, Jesus made it clear that only He has the power to lay down His life (John 10:17-18). He proved His power over death by His resurrection. Jesus gave up His life of His own accord. reign by the governor of Judaea, Pontius Pilatus." himself and living under his laws." moon, and it was the time of the pascal full moon when Christ died." he lived on in the teaching which he had given." Messiah, concerning whom the prophets have reported wonders." naught in his defense and hanged him on the eve of Passover." cross. But they don't recognize Jesus as the Messiah and that He rose from the dead. And that He did those things, you can learn from the ‘Acts of Pilate’. Justin assumed that this record still existed in the official Roman archives and that Antoninus Pius could verify the facts easily. Justin’s whole purpose in writing his letter was to obtain mercy from the highest official in the known world, thus sparing the Christian community a persecution which was becoming so commonplace. It is unlikely that Justin would ask a Roman Emperor to check a document if he did not feel extremely confident that the document existed. Otherwise, he would be foolishly putting his own life and reputation at risk. To go back to the origin of such laws there was an old decree that no one should be consecrated a god by an emperor till he had been approved by the senate. Marcus Aemilus followed this procedure in the case of a false god, Alburnus. This reinforces my argument that among you, godhead is conferred by human approval, if a god does not satisfy man he does not become a god, so according to this it is for man to show favor to God. Tiberius then in whose time the name of Christian came into the world, when a report of this doctrine reached him from Palestine where it originated, communicated to the senate making it clear to them that he favored the doctrine. The senate however, because they had not examined the doctrine for themselves, rejected it. But Tiberius stuck to his own view and threatened to execute any who accused the Christians. Writing about the great fire of Rome that Nero blamed on Christians and disliking Christians himself, Tacitus sought to explain the origins of the movement. Their originator, Christ had been executed in Tiberius’ reign by the governor of Judea, Pontius Pilate. But in spite of this temporary set back, the deadly superstition had broken out afresh not only in Judea (where the mischief had started) but even in Rome. All degraded and shameful practices collect and flourish in the capital. Undoubtedly, one of the cruelest and most humiliating forms of punishment in the ancient world was, according to ancient sources, crucifixion. The Jewish historian Josephus best described it following the siege of Jerusalem by the Romans in AD 66-70 as "the most wretched of deaths." suicide is preferable to the cruel fate of being put on the cross. This form of state terror was widespread across the Roman Empire which included Europe, North Africa and Western Asia. It originated several centuries before the Common Era and continued into the fourth century AD when the practice was discontinued by Constantine, the emperor of Rome. While its origins are obscured in antiquity, it is clear that this form of capital punishment lasted for around 800 years and tens if not hundreds of thousands of individuals were subject to this cruel and humiliating death. Mass executions in which hundreds and thousands died – such as the well known crucifixion of 6,000 followers of Spartacus as part, of a victory celebration along the Appian Way in 71 BCE – appear in the literature. While many people believe that crucifixion was reserved for criminals only as a result of Plutarch's passage that "each criminal condemned to death bears his cross on his back," the literature clearly shows that this class of individuals were not the only ones subjected to this ultimate fate. Alexander the Great had 2,000 survivors from the siege of Tyre crucified on the shores of the Mediterranean. In addition, during the times of Caligula – AD 37-41 – Jews were tortured and crucified in the amphitheater to entertain the inhabitants of Alexandria. Women are seldom if ever mentioned specifically in the ancient sources aside from two passages in the Mishna, one in Tractate Mourning 2.11 which suggests that women may have been sacrificed as well. The second reference is found in Sanhedrin 6.5 in which Simeon B. Shetah had 70 or 80 sorceresses hung in the city of Ashkelon. However, as crucifixion was widely employed with slaves, one can assume that, in the ancient world its use was thus not limited by gender but mainly by class. "When someone is convicted of a crime punishable by death and executed, and you hang him on a tree, his corpse must not remain all night upon the tree; you shall bury him that same day, for anyone hung on a tree is under God's curse." There was one notable exception to this passage in which the victims were first killed via crucifixion rather that being hung on a tree after death. This was the case with the high priest, Alexander Janneus in which 800 Pharisees were crucified in Jerusalem in 267 BC before their wives and children. While on the cross, according to Josephus5 the women and children were then slaughtered. Despite this plethora of literary evidence for crucifixion over the centuries in the ancient world, the direct anthropological evidence amounts to but one case from Jerusalem discovered in 1968. In 1968 building contractors working in a suburb north of Jerusalem accidentally uncovered a Jewish tomb dated to the first century after the death of Christ.6 Lying in a Jewish ossuary bearing the Hebrew inscription 'Jehohanan the son of HGQWL' were the skeletal remains of a man in his twenties, who had been crucified. The evidence for this was based on the right calcaneum (heel bone) of the individual, pierced by an iron nail 11.5 cms. in length. The nail penetrated the lateral surface of the bone emerging on the middle of the surface in which the tip of the nail had become bent. The bending of the tip of the nail upon itself suggests that after the nail penetrated the tree or the upright it may have struck a knot in the wood thereby making it difficult to remove from the heel when the victim was taken from the cross. Remains of olive wood found between the head of the nail and the heel bone suggest that prior to penetrating the heel bone the nail was driven through a wooden plaque so as to increase the head of the nail thus making it difficult for the victim to free his legs from the upright. Due to the taphanomic process which occurred over a period of 2,000 years the skeleton was in a poor state of preservation. Being friable and fragmentary, with many postmortem breaks, the right heel bone was not amenable for proper anthropological investigation. Despite the assertion by Haas in his 1970 article that both legs were affixed by one nail, a subsequent reexamination by Zias and Seketes in 1985, found that many of the conclusions upon which his attempted reconstruction were made, were flawed. For instance, the nail which he reported to be 17-18 centimeters in length was actually only 11.5cm thus making it anatomically impossible to affix two feet with one nail. 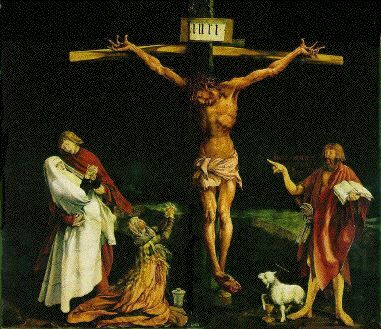 Furthermore, there was no evidence of traumatic injury to the forearms, therefore it would appear that the individual was bound and nailed to the cross as shown in the figure above. This near total absence of any direct anthropological evidence for crucifixion in antiquity bears the question of why, aside from the case described above, is the record silent. There are two possibilities which may account for this silence, one is that most victims may have been tied to the cross. In Christian art, the Good and the Bad thieves are depicted as being tied to the cross despite the fact that the Gospels do not go into detail as to how they were affixed to the cross. Scholars have in fact argued that crucifixion was a bloodless form of death because the victims were tied to the cross. Maxtin Mengel, however who wrote what is perhaps the definitive scholarly report of the subject of Crucifixion in antiquity, takes along with Hewitt (1932) an opposing view. He argues that nailing the victim by both hands and feet was the rule and tying the victim to the cross was the exception. During the first revolt of the Jews against the Romans in AD 66-73, Josephus mentions that in the fall of Jerusalem (AD 70), "the soldiers out of rage and hatred amused themselves by nailing their prisoners in different postures. "9 In spite of these differences of opinion, I would take a differing view and suggest that the number of individuals being crucified may in fact determine the manner in which the execution took form. If, as in the case with the account of 6,000 prisoners of war being crucified along the Via Appia between the cities of Rome and Cappua, as part of a victory celebration it would seem plausible that the most quick and efficient manner was employed. That would be to simply tie the victim to the tree or cross with his hands suspended directly over his head. Death thus would occur within minutes or perhaps an hour if the victims feet were not nailed or tied down. While this would explain the lack of any direct evidence on the human skeleton when tied to the cross, it would not explain the lack of evidence when the victim was nailed. 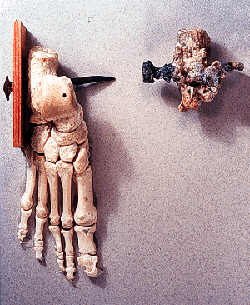 This latter issue is best explained by the fact that nails of a victim crucified were among some of the most powerful medical amulets in antiquity and thus removed from the victim following their death. This is attested to by the Mishriaic passage10 which states that both Jews and Amorites (colloquium for non-Jews) may carry a flail or whip from a crucifixion as a means of healing. For the Jews, this was even, according to some Rabbis, permitted on Shabbath when Jews were normally forbidden to carry object. As this Mishnaic passage mentions both Jews and non-Jews carrying these objects, one can infer the power of these amulets. The complicated and much debated issue regarding how the individual expired on the cross has generated widespread debate over the years. While many researchers have believed that death occurred as the result of a ruptured heart due to the story in John 19:34 of the water and blood flowing out of the wound, pathologists such as Zugibe, have ruled this out as medically untenable. Other scholars have regarded asphyxiation as being the cause of death, however the latest research findings have shown the issue to be more complicated, depending upon the manner in which the victim was affixed to the cross. A series of experiments carried out by an American medical examiner and pathologist on college students who volunteered to be tied to crosses, showed that if the students were suspended from crosses with their arms outstretched in the traditional manner depicted in Christian art, they experienced no problems breathing. Thus the often quoted theory that death on the cross is the result of asphyxiation is no longer tenable if the arms are outstretched. According to the physiological response of the students, which was closely monitored by Zugibe, death in this manner is the result of the victim going into hypovolemic shock. Death is this manner can be in, a manner of hours, or days depending on the manner in which the victim is affixed to the cross. If the victim is crucified with a small seat, a sedile, affixed to the uptight for minimum support in the region of the buttocks, death can be prolonged for hours and days. In fact, Josephus reports that three friends of his were being crucified in Thecoa by the Romans who, upon intervention by Josephus to Titus were removed from the crosses and with medical care one survived. If, however, the victims are tied with their hands extended over their heads and left hanging, death can occur within an hour or, in minutes if the victims legs are nailed so that he cannot use his arms to elevate the body to exhale. For exhaling to occur in a normal manner two sets of muscles are needed, the diaphragm and. the intercostalis muscles between the ribs. With the victims being suspended by their arms directly over their heads, these sets of muscles cannot function properly which results in the victims inability to exhale and results in asphyxiation. Eyewitness accounts by prisoners of war in Dacchu during WWII reported that victims suspended from beams by their wrist, which were tied, expired within ten minutes if their feet were weighted or tied down and within one hour if their feet were unweighted and the victim was able to raise and lower himself to permit respiration. Death in this manner, which is one form of crucifixion, was the result of suffocation. As a deterrent in the ancient world, many of its victims were crucified where the criminal event took place as was the case with thieves or along the cities busiest thoroughfares. The situation can perhaps best be summed up by Quintilian who wrote that, "whenever we crucify the guilty, the most, crowded roads are chosen, where most people can see and be moved by this fear. For penalties relate not so much to retribution as to their exemplary effect." Decl 274 As one of the main objectives of this cruel method of execution was its deterrent value, Roman authorities also devised various means whereby the victim could remain on the cross for days in public before eventually expiring. Thus the manner in which the victims were crucified was not fixed by law but appears dependent on the number of individuals involved, the sadistic ingenuity of those carrying out the execution and the time needed for this spectacle to have its maximum deterrent effect. Giving the victim a proper burial following death on the cross, during the Roman period was rare and in most cases simply not permitted in order to continue the humiliation. Thus the victim was in many cases simply thrown on the garbage dump of the city or left on the cross as food for wild beasts and birds of prey. Crucifixion typically began with a scourging or flogging of the victim’s back. The Romans used a whip called a flagrum, which consisted of small pieces of bone and metal attached to a number of leather strands. The number of blows given to Jesus is not recorded; however, the number of blows in Jewish law was 39 (one less than the 40 called for in the Torah, to prevent a counting error). During the scourging, the skin was ripped from the back, exposing a bloody mass of tissue and bone. Extreme blood loss occurred, often causing death, or at least unconsciousness. In addition to the flogging, Jesus faced severe beating and torment by the Roman soldiers, including the plucking of His beard and the piercing of His scalp with a crown of thorns. After the flogging, the victim was often forced to carry his own crossbar, or patibulum, to the execution site. The patibulum could easily weigh 100 pounds. In the case of Jesus, the record shows that He may have carried His patibulum the distance of over two football fields. In a weak and tormented state, it’s no wonder the record establishes that Jesus needed a great deal of assistance. Once the victim arrived at the execution site, the patibulum was put on the ground and the victim was forced to lie upon it. Spikes about 7 inches long and 3/8 of an inch in diameter were driven into the wrists. The spikes would hit the area of the median nerve, causing shocks of pain up the arms to the shoulders and neck. Already standing at the crucifixion site would be the 7-foot-tall post, called a stipes. In the center of the stipes was a crude seat to “support” for the victim. The patibulum was then lifted on to the stipes, and the victim’s body was awkwardly turned on the seat so that the feet could be nailed to the stipes. At this point, there was tremendous strain put on the wrists, arms and shoulders, resulting in a dislocation of the shoulder and elbow joints. The position of the nailed body held the victim’s rib cage in a fixed position, which made it extremely difficult to exhale, and impossible to take a full breath. Having suffered from the scourging, the beatings and the walk with the patibulum, Jesus was described as extremely weak and dehydrated. He was probably losing significant amounts of blood. As time passed, the loss of blood and lack of oxygen would cause severe cramps, spasmodic contractions and probably unconsciousness. Ultimately, the mechanism of death in crucifixion was suffocation. To breathe, the victim was forced to push up on his feet to allow for inflation of the lungs. As the body weakened and pain in the feet and legs became unbearable, the victim was forced to trade breathing for pain and exhaustion. Eventually, the victim would succumb in this way, becoming utterly exhausted or lapsing into unconsciousness so that he could no longer lift his body off the stipes and inflate his lungs. Due to the shallow breathing, the victim’s lungs would begin to collapse in areas, probably causing hypoxia. Due to the loss of blood from the scourging, the victim probably formed a respiratory acidosis, resulting in an increased strain on the heart, which beats faster to compensate. Fluid would also build up in the lungs. Under the stress of hypoxia and acidosis, the heart would eventually fail. There are several different theories on the actual cause of death for Jesus. One theory is that there was a filling of the pericardium with fluid, which put a fatal strain on the ability of His heart to pump blood. Another theory states that Jesus died of cardiac rupture. Another theory is that Jesus' death was “multifactorial and related primarily to hypovolemic shock, exhaustion asphyxia and perhaps acute heart failure.” Regardless of the actual medical cause of final death, the historical record is very clear -- Jesus suffered numerous hours of horrible and sustained torture on the cross of Calvary. The crucifixion accounts of Jesus Christ are in entire agreement with the customs and practices of the Romans in that period. The evidence for Christ’s horrible and painful death is unquestioned by today’s legitimate scholars. The only dispute is the nature and character of the “criminal” Jesus Christ. Look at the record yourself -- Even with all the pain, Jesus thought of others rather than Himself. His first words from the cross were, "Father, forgive them; for they know not what they do" (Luke 23:34). He thought of His mother, who stood by the cross weeping, and asked his beloved disciple John to take care of her. On either side of Jesus were two thieves executed at the same time. When one of them accepted Jesus as Lord, Jesus shared with him, "To day shalt thou be with Me in paradise" (Luke 23:43). Finally, Jesus expressed his complete surrender to the will of God as He said, "It is finished;" (John 19:30). "Father, into Thy hands I commend My spirit" (Luke 23:46). Investigate the historical record, and then examine your heart. Jesus gave Himself willingly for you and me. Jesus suffered a horrible death for you and me. Jesus loved us so much that He willingly died in utter shame and pain for our sins. In fact, the Bible teaches us that He who was without sin was literally "made sin" for us. God, in human form, allowed himself to be made sin to save us. On the cross, he bore all the world's sin because of His love. The only way to complete His story of love is to love Him in return. Hebrews 12:2 - "Let us fix our eyes on Jesus, the author and perfecter of our faith, who for the joy set before him endured the cross, scorning its shame, and sat down at the right hand of the throne of God." In the last few hours of Jesus' life what did He endure, and what shame did He suffer? The tone of this presentation can best be summarized in the word "excruciate", (the root of the word "excruciating") which refers to something which causes great agony or torment. The Latin roots of the word are :"ex", meaning from or out of, and "cruciate", meaning cross. The word "excruciate" comes from the Latin for "from, or out of, the cross". Jesus spent the last hours before the crucifixion at several places in Jerusalem. He started the evening in the Upper Room, in southwest Jerusalem. At the Last Supper, He told the disciples that His body and His blood were to be given for them. (Matthew 26: 26-29) He went outside of the city to the Garden of Gethesemane. He was then arrested and brought back to the to the palace of the High Priest. where He was questioned by Annas, a former High Priest, and Caiaphas, Annas' son in law . Afterwards, He was tried by the Sanhedrin, and found to be guilty of blasphemy by proclaiming Himself the Son of God. He was sentenced to the death penalty. Since only the Romans were able to execute criminals, He was sent to Pontius Pilate at the Antonia Fortress. Pilate, not finding anything wrong, sent Him to King Herod , who returned Him back to Pilate. Pilate, submitting to the pressure of the crowd, then ordered that Jesus be flogged and crucified. He was finally led out of the city walls to be crucified at Calvary. The ordeal began in an upper room of a house at what we now call the Last Supper, where Jesus, in giving the first communion, predicted that His body and blood would be given. (Matt 26:17-29) Today in Jerusalem, one can visit the Cenacle or Cenaculum (Latin for dining hall), a room which is built over what is believed to be the site of the Upper Room, (Kollek) which was located on the southwestern aspect of the old city. 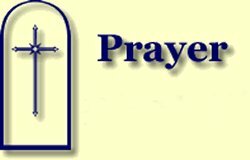 Luke 22:44 And being in anguish, he prayed more earnestly, and his sweat was like drops of blood falling to the ground. "the Spirit of God ....crushed"
From the upper room, Jesus went outside of the city walls where he spent time in prayer at the Garden of Gethesemane. The garden has many ancient olive trees today, some of which may have grown from the roots of the trees that were present in Jesus' time. (All trees in and around Jerusalem were cut down when the Romans conquered the city in 70 A.D. Olive trees can regenerate from their roots and live for thousands of years.) The name "Gethesemane", comes from the Hebrew Gat Shmanim, meaning "oil press". Since "oil" is used in the Bible to symbolize the Holy Spirit, it may be said that the garden is where "the Spirit of God was crushed". It was here that Jesus agonized in prayer over what was to occur. It is significant that this is the only place in the KJV where the word "agony" is mentioned. (Strong's concordance) The Greek word for agony means to be "engaged in combat" Jesus agonizes over what He is to go through, feeling that He is at the point of death. (Mark14:34) Yet He prays, "Not my will, but thine be done." Of medical significance is that Luke mentions Him as having sweat like blood. The medical term for this, "hemohidrosis" or "hematidrosis" has been seen in patients who have experienced, extreme stress or shock to their systems. The capillaries around the sweat pores become fragile and leak blood into the sweat. A case history is recorded in which a young girl who had a fear of air raids in WW1 developed the condition after a gas explosion occurred in the house next door. Another report mentions a nun who, as she was threatened with death by the swords of the enemy soldiers," was so terrified that she bled from every part of her body and died of hemorrhage in the sight of her assailants." As a memorial to Jesus' ordeal, a church which now stands in Gethesemane is known as the Church of the Agony. (also called the Church of the Nations because many nations donated money to its construction. Matthew 26:56: "Then all the disciples deserted him and fled." Psalm 22:11: "Do not be far from me, for trouble is near and there is no one to help." While in Gethsemane, Jesus is betrayed by Judas and arrested by the Jews. His disciples all desert Him, even at the expense of running away naked (Mark 14:51-52). He is bound (John 18:12) then brought back to the city to the court of the High Priest, which is located near the Upper room. Deuteronomy 19:15: "One witness is not enough to convict a man accused of any crime or offense he may have committed. A matter must be established by the testimony of two or three witnesses." Deuteronomy 17:6: "On the testimony of two or three witnesses a man shall be put to death, but no one shall be put to death on the testimony of only one witness." Mark 14:56: "Many testified falsely against him, but their statements did not agree." Any arrest could not be made at night. The time and date of the trial were illegal because it took place at night and on the eve of the Sabbath. This time precluded any chance for the required adjournment to the next day in the event of a conviction. The Sanhedrin was without authority to instigate charges. It was only supposed to investigate charges brought before it. In Jesus' trial, the court itself formulated the charges. The charges against Jesus were changed during the trial. He was initially charged with blasphemy based upon His statement that He would be able to destroy and rebuild the Temple of God within three days, as well as His claim to be the Son of God. When He was brought before Pilate, the charge was that Jesus was a King and did not advocate paying taxes to the Romans. As stated above, the requirement of two witnesses in agreement to merit the death penalty was not met. The court did not meet in the regular meeting place of the Sanhedrin, as required by Jewish law. Christ was not permitted a defense. Under Jewish law, an exhaustive search into the facts presented by the witnesses should have occurred. Today, one can visit the palace of the High Priest. where one can stand in the midst of the ruins of the courtyard. A model of the structure in Jesus' time is available for viewing. Mark 15:15 - "Wanting to satisfy the crowd, Pilate released Barabbas to them. He had Jesus flogged, and handed him over to be crucified." The Sanhedrin met early the next morning and sentenced Him to death. (Matthew 27:1) Because the Jews were not, and the Romans were, able to carry out an execution, Jesus was brought before Pilate. The charge was now changed to an allegation that Jesus claimed to be King and forbade the nation to pay taxes to Caesar. (Luke 23:5) In spite of all the charges, Pilate finds nothing wrong. He sends Jesus to Herod. Jesus is speechless before Herod, except to affirm that He is King of the Jews. Herod sends Him back to Pilate. Pilate is unable to convince the crowds of Jesus' innocence and orders Jesus to be put to death. Some sources state that it was Roman law that a criminal that was to be crucified had to be flogged first. Others believe that Jesus was flogged first by Pilate in the hope of getting Him off with a lighter punishment. In spite of his efforts, the Jews allow Barabbas to be released and demand that Jesus be crucified, even crying that ,"His blood be on us and on our children!" (Matthew 27:25) Pilate hands Jesus over to be flogged and crucified. It is at this point that Jesus suffers a severe physical beating. During a flogging, a victim was tied to a post, leaving his back entirely exposed. The Romans used a whip, called a flagrum or flagellum which consisted of small pieces of bone and metal attached to a number of leather strands. The number of strikes is not recorded in the gospels. The number of blows in Jewish law was set in Deuteronomy 25:3 at forty, but later reduced to 39 to prevent excessive blows by a counting error. The victim often died from the beating. (39 hits were believed to bring the criminal to "one from death".) Roman law did not put any limits on the number of blows given. During the flogging, the skin was stripped from the back, exposing a bloody mass of muscle and bone. Extreme blood loss occurred from this beating, weakening the victim. perhaps to the point of being unconscious. Isaiah 50:6: "I offered my back to those who beat me, my cheeks to those who pulled out my beard; I did not hide my face from mocking and spitting." Isaiah 52:14: "..... Just as there were many who were appalled at him -- his appearance was so disfigured beyond that of any man and his form marred beyond human likeness--"
From the beating, Jesus walked on a path, now known as the Via Dolorosa or the "way of suffering", to be crucified at Golgotha. The total distance has been estimated at 650 yards. (Edwards). A narrow street of stone, it was probably surrounded by markets in Jesus' time. He was led through the crowded streets carrying the crossbar of the cross (called a patibulum) across His shoulders. The crossbar probably weighed between 80 to 110 pounds. He was surrounded by a guard of Roman soldiers, one of which carried a titulus, a sign which announced His crime of being "the King of the Jews" in Hebrew, Latin and Greek. On the way, He was unable to carry the cross. Some theorize that he may have fallen while going down the steps of the Antonio Fortress. A fall with the heavy patibulum on His back may have led to a contusion of the heart, predisposing His heart to rupture on the cross. (Ball) Simon of Cyrene (currently North Africa (Tripoli)), who apparently was affected by these events, was summoned to help. The present Via Dolorosa was marked in the 16th century as the route over which Christ was led to His crucifixion. As is the location of Calvary, the true location of the Via Dolorosa is disputed. Much tradition as to what happened to Jesus is encountered on the Via Dolorosa today. There are 14 stations of 'events' that occurred and 9 churches on the way today. The stations of the cross were established in the 1800's. (Magi) Today, there is one section of the path where one can walk on the stones which were used during Jesus time. Psalms 22:16-17: Dogs have surrounded me; a band of evil men has encircled me, they have pierced my hands and my feet. I can count all my bones; people stare and gloat over me." The crucifixion event is prophesied in several places throughout the Old Testament. One of the most striking is recorded in Isaiah 52:13 ,where it says that , "My servant will act wisely (or prosper) .He will be raised and lifted up and greatly exalted." In John 3, Jesus talks about His fulfillment of that prophecy when He says, "Just as Moses lifted up the snake in the desert, so the Son of Man must be lifted up that everyone who believes in Him may have eternal life." He refers to the events recorded in Numbers 21:6-9. The Lord had sent a plague of fiery serpents on the people of Israel and they bit the people so that many of the people died. After the people confessed their sin to Moses, the Lord for gave them by having a bronze serpent made. Bronze is a symbol for judgment and the serpent is a symbol of the curse. Whoever was bitten by a serpent and then looked at the bronze serpent, was saved from death.. These verses are prophecies that point to the crucifixion, in the Jesus would be (lifted up ) on the cross for the judgment of sin, so that whoever believed in Him should not die (an eternal death), but live an eternal life. II Corinthians 5 :21 amplifies this point, in that "He (the Father) made Him who knew no sin (the Son) to be sin on our behalf, so that we might become the righteousness of God in Him. It is interesting that the sign of Aesculapius which is the symbol of the medical profession today, had its roots from the making of the bronze serpent. Indeed, Jesus is the healer of all! Jesus is led to the place of the skull (Latin Calvary, Aramaic :Golgotha) to be crucified. The actual location of Calvary is also in dispute. At the end of the Via Dolorosa, there is a "T intersection". If one turns left, we go to the Church of the Holy Sepulcher. If one turns to the right, one goes to Gordon's Calvary. The Church of the Holy sepulcher has long been believed to be the traditional site of the crucifixion. Gordon's Calvary has a possible prophetic reason for being the actual site of the crucifixion. In Genesis 22, Abraham is tested by God to sacrifice Isaac on the top of a mountain. Realizing that he is acting out a prophecy, that "God Himself will provide a Lamb" , Abraham calls the place of the event "Jehovah Jireh", meaning "In the mount of the Lord it shall be seen." If we take this as a prophetic event of Jesus' death, then Jesus' died on the high ground of Jerusalem. 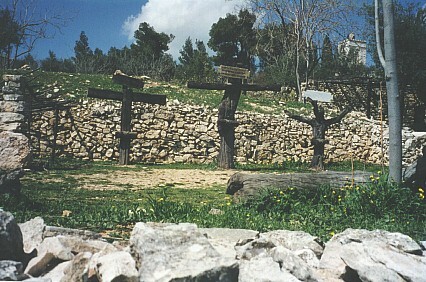 Gordon's Calvary is the highest point of Jerusalem, 777 meters above sea level. Today, at Gordon's Calvary, caves in the rock are situated which give the site the appearance of a skull. Jesus was then crucified. Crucifixion was a practice that originated with the Persians and was later passed on to the Carthaginians and the Phoenicians. The Romans perfected it as a method of execution which caused maximal pain and suffering over a period of time. Those crucified included slaves, provincials and the lowest types of criminals. Roman citizens, except perhaps for soldiers who deserted, were not subjected to this treatment. The crucifixion site "was purposely chosen to be outside the city walls because the Law forbade such within the city walls...for sanitary reasons ... the crucified body was sometimes left to rot on the cross and serve as a disgrace, a convincing warning and deterrent to passers by." Sometimes, the subject was eaten while alive and still on the cross by wild beasts. The procedure of crucifixion may be summarized as follows. The patibulum was put on the ground and the victim laid upon it. Nails, about 7 inches long and with a diameter of 1 cm ( roughly 3/8 of an inch) were driven in the wrists . The points would go into the vicinity of the median nerve, causing shocks of pain to radiate through the arms. It was possible to place the nails between the bones so that no fractures (or broken bones) occurred. Studies have shown that nails were probably driven through the small bones of the wrist, since nails in the palms of the hand would not support the weight of a body. In ancient terminology, the wrist was considered to be part of the hand. Standing at the crucifixion sites would be upright posts, called stipes, standing about 7 feet high. In the center of the stipes was a crude seat, called a sedile or sedulum, which served a support for the victim. The patibulum was then lifted on to the stipes. The feet were then nailed to the stipes. To allow for this, the knees had to be bent and rotated laterally, being left in a very uncomfortable position. The titulus was hung above the victim's head. There were several different types of crosses used during crucifixion. In Jesus' time, it was most likely that the cross used was a T shaped (or tau cross,), not the popular Latin, or t shaped cross which is accepted today. Psalms 22:14-15: "I am poured out like water, and all my bones are out of joint. My heart has turned to wax; it has melted away within me. My strength is dried up like a potsherd, and my tongue sticks to the roof of my mouth; you lay me in the dust of death." Matthew 27:46: "About the ninth hour Jesus cried out in a loud voice, "Eloi, Eloi, lama sabachthani?' --which means, My God, my God, why have you forsaken me?" Due to the shallow breathing, the victim's lungs begin to collapse in small areas. causing hypoxia and hypercarbia. A respiratory acidosis, with lack of compensation by the kidneys due to the loss of blood from the numerous beatings, resulted in an increased strain on the heart, which beats faster to compensate. Fluid builds up in the lungs. Under the stress of hypoxia and acidosis the heart eventually fails. There are several different theories on the actual cause of death. One theory states that there was a filling of the pericardium with fluid, which put a fatal strain on the ability of the heart to pump blood. Another theory states that Jesus died of cardiac rupture." The actual cause of Jesus' death, however, "may have been multifactorial and related primarily to hypovolemic shock, exhaustion asphyxia and perhaps acute heart failure." A fatal cardiac arrhythmia may have caused the final terminal event. John 19:29-30 "A jar of wine vinegar was there, so they soaked a sponge in it, put the sponge on a stalk of the hyssop plant, and lifted it to Jesus' lips." When he had received the drink, Jesus said, `It is finished'. "With that, he bowed his head and gave up his spirit." Having suffered severe blood losses from His numerous beatings and thus in a dehydrated state, Jesus, in one of His final statements, said "I thirst." He was offered 2 drinks on the cross. The first, which He refused, was a drugged wine (mixed with myrrh). He chose to face death without a clouded mind. "It was a merciful Jewish practice to give to those led to execution a draught of strong wine mixed with myrrh so as to deaden consciousness" This charitable office was performed at the cost of, if not by, an association of women in Jerusalem. The draught was offered to Jesus when He reached Golgotha. But having tasted it....He would not drink it. ....He would meet Death, even in his sternest and fiercest mood, and conquer by submitting to the full. The second drink, which He accepts moments before His death, is described as a wine vinegar. Two points are important to note. The drink was given on the "stalk of a hyssop plant". Remember that these events occurred at the Feast of the Passover. During this feast, (Exodus 12:22) hyssop was used to apply the blood of the Passover lamb to the wooden doorposts of the Jews. It is interesting the end of this hyssop stalk pointed to the blood of the Perfect Lamb which was applied to the wooden cross for the salvation of all mankind. In addition, the wine vinegar is a product of fermentation, which is made from grape juice and yeast. The word literally means "that which is soured" and is related to the Hebrew term for "that which is leavened". Yeast or leaven, is a Biblical symbol of sin. When Jesus took this drink, (i.e. a drink which was "leavened") it is thus symbolic of His taking the sins of the world into His body. Psalm 22:12-13: "Many bulls surround me; strong bulls of Bashan encircle me. Roaring lions tearing their prey open their mouths wide against me." While He was on the cross, darkness covered the land (noon to three p.m.). Jesus, in Luke 22:53, associates those who arrested Him with the power of darkness. Where were the evil forces while Jesus was on the cross? The verses above from Psalm 22 seem out of place when first read. There seems to be no mention of "bulls" and "lions" around the cross. The verses, however, have a deeper meaning. Bashan was an area to the east of the Jordan River which was famous for its fertility. Cattle were raised there which grew to enormous sizes. The people there worshipped demon spirits (associated with Baal) within the cattle. In 1 Peter 5:8, Satan is described as "a roaring lion...seeking those who he may devour" These verses are thus suggestive of the spiritual activity of Satan and his demons, celebrating as Jesus was suffering on the cross. John 10:17-18 "The reason my Father loves me is that I lay down my life--only to take it up again. No one takes it from me, but I lay it down on my own accord. I have authority to lay it down and authority to take it up again. This command I received from my Father." Luke 23:46 "Jesus called out with a loud voice, 'Father, into your hands I commit my spirit'." When he had said this, he breathed his last. HASTENED by the breaking of the legs, so that the victim could not push up to take a good breath. John 19:32-33: The soldiers therefore came and broke the legs of the first man who had been crucified with Jesus, and then those of the other. But when they came to Jesus and found that he was already dead, they did not break his legs. CONFIRMED by a spear thrust into the right side of the heart. To confirm that a victim was dead, the Romans inflicted a spear wound through the right side of the heart. When pierced, a sudden flow of blood and water came Jesus' body . The medical significance of the blood and water has been a matter of debate. One theory states that Jesus died of a massive myocardial infarction, in which the heart ruptured which may have resulted from His falling while carrying the cross. Another theory states that Jesus' heart was surrounded by fluid in the pericardium, which constricted the heart and caused death. The physical stresses of crucifixion may have produced a fatal cardiac arrhythmia. The stated order of "blood and water" may not necessarily indicate the order of appearance, but rather the relative prominence of each fluid. In this case, a spear through the right side of the heart would allow the pleural fluid (fluid built up in the lungs) to escape first, followed by a flow of blood from the wall of the right ventricle. The important fact is that the medical evidence supports that Jesus did die a physical death. Revelation 5:6: Then I saw a Lamb, looking as if it had been slain, standing in the center of the throne, encircled by the four living creatures and the elders. In eternity, Jesus will bear the marks of His crucifixion. Revelation 5:6 suggests that He appears in heaven with the marks as a Lamb "looking as if it had been slain". We know that when He appeared to Thomas that He bore the scars of the nails and the spear in His side. (John 20:26-28) It is also worth considering reasons as to why He was not immediately recognized after His resurrection. In John 21:12, it is stated that the disciples did "not dare to ask Him His identity, because they knew that it was the Lord." It is possible that His resurrection body still has the marks of His beatings. "The body of His glorification will be the body of His humiliation." Are we ready to meet Him? What have we done with what He has given to us?. Today, He encourages us to consider the cost of the cross and to apply it to our own lives. Luke 9:23: Then he said to them all: "If anyone would come after me, he must deny himself and take up his cross daily and follow me." When He was on earth, Jesus stated that , "If any man would come after me, let him take up his cross daily and follow me." (Luke 9:23) As we have seen, in Jesus' time it meant going to your death, giving up and separating yourself from all that you had.......your rights, your friends, your body and blood and even your "god", to follow Him. We are challenged by the example of Simon of Cyrene. Scripture mentions Him as being the father of Alexander. (Mark 15:21) ("a choice man in the Lord") and Simon's wife were both addressed by Paul in his letter to the Roman church. (Romans 16:13) Here was a man, who indeed carried the cross...and made an impact for Christ in eternity. What commitment are you willing to make to Him now? The Bible, God's Word (II Timothy 3:16-17), relates how God once had a personal relationship with man. God would talk and relate to man, just as you might relate to your best friend. God created man to give him a meaningful and purposeful life. Dear Lord Jesus. Thank you for dying on the cross for me. I confess that I am a sinner before God. I acknowledge that by your death and sacrifice that you have paid the penalty of my sins for me. Please come into my heart and become the Lord of my life. As you gave your life, I give my life to you. I will take up my cross and follow you, not as I will, but to follow Your perfect will for my life. In Jesus Name, Amen. A superficial reading of the gospel narratives concerning the death of Jesus will show that He was nailed to the cross at 9 o'clock in the morning, and was dead by 3 in the afternoon. His terrible ordeal, it would seem, was over in a mere six hours. Then, too, Jesus had been up the rest of the night without sleep enduring scourging, beating, cruel mockery and unspeakable brutality. He was already weakened when he carried his cross, stumbling, to the place of crucifixion alongside the main public highway, probably just outside the Damascus Gate. Several medical doctors and forensic experts have written books about the common Roman form of execution---death by crucifixion. Often the process took several days. The nailing of hands and feet forced the victim to push up against the weight of his own body to take a single breath. In the hot sun, terrible thirst ensued and death came in most cases from suffocation amidst great pain. 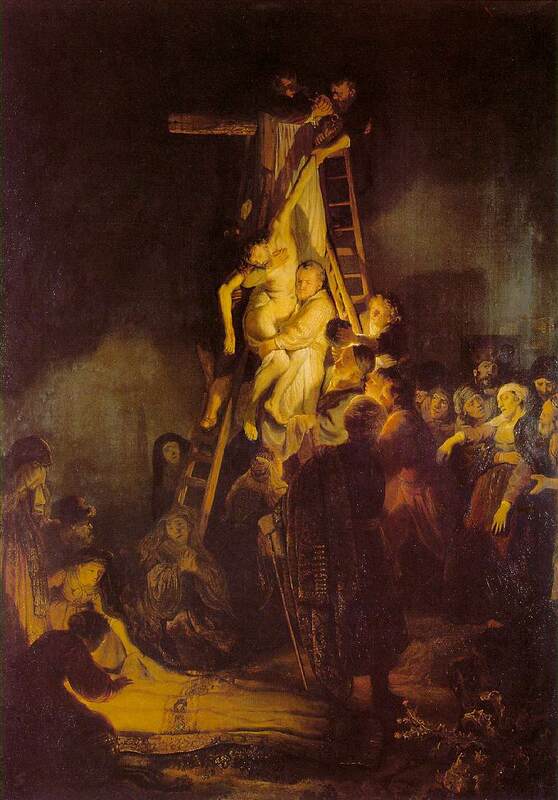 The victim was also naked and humiliated---death on the cross was reserved for the most wretched of all criminals. There is much more to the death of Jesus on the cross than the visible suffering, terrible pain and suffering, and the incredible ignominy of such a horrible death for One who was not only innocent but also the very Son of God. The above passage reveals that not only did Jesus take upon Himself the sins of mankind when He died for us on the cross, but He also met fully the onslaught of demons, fallen angels, and all the power of evil forces in the heavens as well, disarming all of them completely. Two aspects of the death of Christ show something of the mystery of His death and the suffering He took onto Himself for our sake. The death of Jesus on the cross took but six hours as measured in dynamical time. Jesus was, for the first three hours on the cross, our Great High Priest. From noon till 3 P.M., during which time a strange and terrible darkness came over the earth, the High Priest became the Sacrifice. If we now consider the nature of time and eternity it must surely become clear that what was (for us) three hours' suffering by Jesus in total estrangement from the Father---was for Jesus an event in eternity which never ends. The work of Jesus on the cross, as far as we are concerned, is completely finished. Jesus is not now hanging on a cross. He has been raised from the dead, and sits in heaven, fully in charge of the universe as a resurrected man. One man, one son of Adam, Jesus the Lord is now living in glory and He is in charge of the universe. But in another sense, if we could step into eternity and view an eternal being such as the Son of God experiencing life---if we could see things from the vantage point of eternity---then we would perceive that a part of the eternal God must suffer forever, outside of time, because of human sin. The statement of Jesus to one of the thieves crucified alongside him was, "Truly, I say to you, today you will be with me in Paradise." (Luke 23:43) This statement suggests that when He died, Jesus left our time frame and immediately entered eternity. Likewise, the spirit of his companion on an adjacent cross, the dying, redeemed thief also left time and entered eternity when he also died that same day. The next event in eternity for the human spirit of Jesus was His return to reenter His body in the tomb just before dawn on Easter Sunday morning. By means of the mighty power of the Holy Spirit, He then experienced the complete transformation of His body and His resurrection "out from among the dead." In the time frame of earth, these events are separated by perhaps 40 hours, but in eternity they are an immediate sequence of events, one following another. The dying thief was not raised from the dead at the same earth time as Jesus was raised from the dead. However, in his own (the thief's) consciousness, he stepped out of time to join the general resurrection of all the righteous dead which coincides in history with the Second Coming of Christ. Notice that phrase: "the Lamb that was slain from the creation of the world." This statement confirms again that time is not a factor in eternity. The death of the Lamb actually took place in time, on earth, at a specific date on the calendar--yet it is reckoned here as an eternal event which has meaning for people who have lived ever since the beginning of time. That is why an Old Testament saint such as Abraham could be born again by grace through faith just like a New Testament saint--even though the tree which would be hewn into the cross of Christ had not even been planted as a seed in Abraham's time! The death of Jesus Christ was an event that can be fixed at a particular set of coordinates in space and time-yet it is also the summit of God's eternal program, utterly transcending both space and time. Thus the cross casts its shadow over all of creation. In this sense, neither heaven nor hell are yet populated---all believers reach heaven at the same "time." The dying thief, Stephen the first martyr, the Apostle John, and all the rest of us will arrive in heaven at precisely the same "instant," experiencing neither soul sleep nor loss of consciousness nor time delay, whether the interval between our death and the Second Coming is a hundred years or one hour. The thief on the cross, in his own consciousness, will experience arriving in Paradise the very same day he died, as Jesus promised he would. (Of course if heaven is still empty, except for Jesus, from our vantage point in time, the prayer to Mary or St. Jude or any of the saints is pointless. These believers are each "time traveling" in their own split-second interval separating their individual death from the great resurrection of all of us believers. Thus, we all get to heaven at the same "time." In His sinless and perfect human body---prepared especially as a perfect blood sacrifice for the sins of the world---Jesus suffered terribly in body, soul, and spirit during the long night of His trial. That suffering began with the agony in the garden of Gethsemane and in all the humiliating events of His trial and cruel torture prior to His morning journey to Golgotha. The worst was yet to come. Death by crucifixion is an especially painful and terrible death. It was common in Roman times for crucified men in good health to hang dying on a cross sometimes for days, yet Scripture records that Jesus died within six hours' clock time. Even if He only suffered normal human pain in this ordeal it would have been incredibly severe. All this pain, however, was but the prelude to His real suffering, which involved being cut off from the Father's love and presence and consigned to carry our sins out of the universe, to hell as it were, like the scapegoat sacrifice of Israel of which he, Christ, is the antitype. The Scripture records three statements by Jesus during the first three hours on the cross when He served as the true Great High Priest before the Father and four further statements during the time of darkness from noon to 3 P.M. when the High Priest became the Sin-Offering. It was during the latter three hours, evidently, that the sins of all mankind were laid upon Jesus and the Father turned His face away from His beloved Son. "For our sake he made him to be sin who knew no sin, so that in him we might become the righteousness of God." from the words of my groaning? Yet thou art holy, enthroned on the praises of Israel. they trusted, and thou didst deliver them. in thee they trusted, and were not disappointed. scorned by men, and despised by the people. let him rescue him, for he delights in him!" thou didst keep me safe upon my mother's breasts. and since my mother bore me thou hast been my God. Be not far from me, for trouble is near and there is none to help. thou dost lay me in the dust of the earth. and for my raiment they cast lots. But thou, O LORD, be not far off! O thou my help, hasten to my aid! Deliver my soul from the sword, my life from the power of the dog! my afflicted soul from the horns of the wild oxen! and stand in awe of him, all you sons of Israel! but has heard, when he cried to him. May your hearts live for ever! and all the families of the nations shall worship before him. and he who cannot keep himself alive. that he has wrought it. Paul wrote many years later of the "fellowship of Christ's sufferings" and of "making up in his own body what is lacking in the sufferings of Christ for the sake of his body, that is the church." He spoke of "always bearing about in the body the dying of Jesus, so that the life of Jesus might be revealed in us..." He said these things long after Jesus had risen from the dead and ascended into heaven where He now rules, His work on the cross having been completed and finished. "All through the Bible we see God's love is manifest to men and women everywhere in urging them to escape this judgment. God in love pleads with people, 'Do not go on to this end!' But ultimately he must judge those who refuse his offer of grace. He says, in effect, 'I love you and I can provide all you need. Therefore love me, and you will find the fulfillment your heart is looking for.' But many men and women say, 'No, I do not want that. I will take your gifts, I will take all the good things you provide, but I do not want you! Let me run my own life. Let me serve my own ends. Let me have my own kingdom.' To such, God ultimately says, 'All right, have it your way!' God has three choices: first, he can let rebellion go on forever and never judge it. In that case the terrible things that are happening on earth, all these distressing injustices, the cruelty, the anger, the hate, the malice, the sorrow, the hurt, the pain, the death that now prevails, must go on forever. God does not want that, and neither does man. Second, God can force men to obey him and control them as robots. But he will never do that because that means they cannot truly love him. Love cannot be forced. Therefore, third, the only choice God really has is that he must withdraw ultimately from those who refuse his love. He must let them have their own way forever. That results in the terrible torment of godlessness. If God is necessary to us, then to take him out of our lives is to plunge us into the most terrible sense of loneliness and abandonment that mankind can know. We have all experienced it to some small degree when we get what we want and then discover we do not want what we got! For that sense of bored emptiness to go on forever, is unspeakable torment." God Suffers Far More than Any Man! In reading all these passages it is easy to concentrate on what appears to be "unjust" punishment (from our self-righteous human viewpoint), or at least tragic human suffering. We would like to think it could somehow have been avoided! Most of us shrink from thinking too seriously about these passages knowing that but for the grace of God we would have, and should have, been sent to this terrible fate also. A reflection on the nature of God, for God is love, makes it clear that maintaining hell must be a terrible torment and pain to a God who is self-giving love. He is the Holy One who "takes no pleasure in the death of the wicked," and who "is not willing that any should perish." God must be willing, therefore, to pay the price of His own eternal pain, suffering, and hell so that the few who are righteous, (by faith), might enjoy eternal bliss. Such is another aspect of the mystery of the suffering of Christ on the cross. Most of us are accustomed to thinking that we suffer more than God, and that He surely cannot fully identify with our minor pains and afflictions. But a loving God who created us for good things surely suffers infinitely more than any human parent when a beloved child refuses the good and chooses the path leading to destruction. Surely it must be grievously painful for a God who is love to be denied the opportunity to give of Himself to the objects of His love. No man can suffer more than Christ has already suffered, nor can mortal man contemplate what is meant by the "longsuffering" of our God (who is outside of time) which will continue, we are assured, at least until the world is changed. "God's kindness is meant to lead us to repentance," Paul writes in Romans, Chapter 2. How great is that kindness! "God is going to invade this earth in force. But what's the good of saying you're on his side then, when you see the whole natural universe melting away like a dream and something else, something it never entered your head to conceive comes crashing in. Something so beautiful to us and so terrible to others that none of us will have any choice left. This time it will be God without disguise; something so overwhelming that it will strike either irresistible love, or irresistible horror into every creature. It will be too late then to choose your side. There is no use saying you choose to lie down, when it's become impossible to stand up. That will not be the time for choosing; it will be the time when we discover which side we really have chosen, whether we realize it or not. Now, today, in this moment, is our chance to choose the right side. God is holding back to give us that chance. It will not last forever; we must take it or leave it." In spite of our outward circumstances and the downward spiral of moral, economic, political, and social conditions over the face of the earth, the Good News of the Bible is that evil has already been dethroned and its power over mankind and nature broken. The new creation is as inevitable as springtime's greening and blossoming. The loving heart of God our Father longs for us to accept his mercy, his forgiveness and mercy. He has gone to infinite lengths to make provision for us in the cosmic sacrifice of the Son of His love. "Behold, my servant shall prosper, he shall be exalted and lifted up, and shall be very high. As many were astonished at him---his appearance was so marred beyond human semblance, and his form beyond that of the sons of men---so shall he startle many nations; kings shall shut their mouths because of him; for that which has not been told them they shall see, and that which they have not heard they shall understand. "Who has believed what we have heard? And to whom has the arm of the LORD been revealed? For he grew up before him like a young plant, and like a root out of dry ground; he had no form or comeliness that we should look at him, and no beauty that we should desire him. He was despised and rejected by men; a man of sorrows and acquainted with grief; and as one from whom men hide their faces he was despised, and we esteemed him not. Surely he has borne our grief and carried our sorrows; yet we esteemed him stricken, smitten by God, and afflicted. But he was wounded for our transgressions, he was bruised for our iniquities; upon him was the chastisement that made us whole, and with his stripes we are healed. "All we like sheep have gone astray; we have turned every one to his own way; and the LORD has laid on him the iniquity of us all. He was oppressed, and he was afflicted, yet he opened not his mouth; like a lamb that is led to the slaughter; and like a sheep that before its shearers is dumb, so he opened not his mouth. By oppression and judgments he was taken away; and as for his generation, who considered that he was cut off out of the land of the living, stricken for the transgression of my people? "And they made his grave with the wicked and with a rich man in his death, although he had done no violence, and there was no deceit in his mouth. Yet it was the will of the LORD to bruise him; he has put him to grief; when he makes himself an offering for sin, he shall see his offspring, he shall prolong his days; the will of the LORD will prosper in his hand; he shall see the fruit of the travail of his soul and be satisfied; by his knowledge shall the Righteous One, My Servant, make many to be accounted righteous; and he shall bear their iniquities. "...But at noon, something dramatic happens. The sky goes dark and Jesus cries out "My God, My God, why have you forsaken me?!" The Son is separated from the Father for the first time in eternity...this continues for only three hours...and at 3.00 pm Jesus wills himself to death. He cries 'it is finished' (the Greek phrase actually has a technical meaning in those days of 'paid in full'--it was so used when people were released from debtors prison and their unpaid bill was stamped 'paid in full'--same phrase). And then he decides to die and gives up his spirit. So those three HOURS are the only slice of time in all of eternity that the Son experiences brokenness in his relationship with his Father. As to the 3 hours themselves, the theology tells us that during those Jesus 'paid for the sins of the whole world' (John the Baptist made this clear when he called him the Lamb, which takes away the sins of the whole world). What did this entail? The concise statement is that God the Father, who had loved/enjoyed/delighted/ fellowshipped with the Son at the most intimate of levels (they actually shared the same essence--the trinity doctrine) for all eternity, suddenly turned his back on His Son, and for three hours poured His awesome wrath out on His Son (instead of on us, incredibly!). So one component was the abandoning His Son (to save the world), and the other was the very active outpouring of judicial punishment upon Him to generate the 'paid in full' comment." If Matthew 12:40 literally means three days and three nights then the crucifixion cannot be on Friday. Some say rather than a literal three days it is an old idiom referring to the two days prior to the day being spoken of. We have found nothing to substantiate this view. The Friday crucifixion is the most widely held view due to the traditional celebration of Easter. Did the crucifixion actually take place on Wednesday, Thursday or Friday? In order to make the most informed estimate, we need to examine the Sabbath. The original Hebrew word "Shabbath" is defined as: an intermission, the day of rest, the holy seventh day; a week (Leviticus 23:15 , Deuteronomy 16:9; Matthew 28:1, the sacred seventh year, a sabbatical year. Leviticus 23:1-4 lets us know about the "weekly Sabbath," that day set aside each week to honor the Lord. Verse three defines how a Sabbath is to be observed, i.e., "... but the seventh day is the Sabbath of rest, an holy convocation: you shall do no servile work therein: it is the Sabbath of the Lord in all your dwellings." However, these are NOT the only Sabbaths. Besides the weekly Sabbaths there are the High Sabbaths related to the Hebrew Feasts (or Festivals), described in Leviticus 23:4-44. For example, the verses above speak of two feasts, Passover and Unleavened Bread. Passover starts on the 14th day of Nisan (Hebrew month) and lasts one day. The Feast of Unleavened Bread starts the next day (i.e., the 15th of Nisan) and lasts for seven days. Please note, the Passover is not a high Sabbath day, this important fact is often overlooked. You can tell because the usual command for a Sabbath of "an holy convocation and no servile work is to be done," is not given for Passover. So while Passover is a feast day, it is not a Sabbath day. "Why is that important?" you ask. It was on this day Jesus did the work of redemption. Servile work would have been unlawful on a Sabbath day, so God ordained for this day to be a festival, remembering the lamb's blood that caused the angel to "Passover" the Israelites in Egypt and pointing to the Lamb who would shed His blood for all mankind. One other important feast day is not a high Sabbath day, the Feast of First Fruits. Interestingly enough, this is the day of Jesus' resurrection. The Lord set forth two Sabbath days each for the Feast of Unleavened Bread and the Feast of Tabernacles. Leviticus 23:7-8 tells us that both the first and seventh (last) day of the Feast of Unleavened Bread is an holy convocation and to do no servile work therein. Leviticus 23:35-36 states the same for the Feast of Tabernacles. As you go through the remaining feasts you will see the same instruction. Next we need to examine what Jesus said regarding His death. Jesus said three days and three nights. There is absolutely no way to get three days and three nights from Friday to Sunday. The chart below shows this, remember a Jewish day starts at sunset rather than midnight. the scriptures (the scriptures merely state that Mary Magdalene went to the tomb right after sunrise), there still are only two nights. There is no way to get three nights in this scenario. To dogmatically choose this position of crucifixion on Friday and Resurrection on Sunday is to choose a position contrary to Jesus' own prophecy. Another scripture to consider is John 12:1, "Then Jesus six days before the Passover came to Bethany..." Jesus was traveling from Jericho. If the crucifixion took place on Friday (which had to also be Passover), then this journey took place on the Sabbath. Traveling that distance on the Sabbath was legally out of the question for a devout Jew. What if the crucifixion took place on Thursday? This would certainly add the additional night we need to fulfill Jesus' prophecy, but it raises a problem with the days because you have to count partial days for either the crucifixion or resurrection, but not for both. The partial days problem can be argued successfully but not conclusively because, as stated earlier, all we are told about the resurrection is that Jesus arose on the day after the weekly Sabbath. This could be anytime from Saturday just after sunset to the point where Mary Magdalene saw Him, after sunrise. Proponents of a Thursday crucifixion might argue counting a partial day for Thursday (the crucifixion), a day for Friday, a day for Saturday (day) and that Jesus arose just after sunset at the beginning of the fourth day which would not be counted. In addition, there would be three full nights in between as well. So Thursday can be argued from the Scriptures. In this view, Jesus is resurrected sometime between sunset on Saturday and sunrise on Sunday, which would be a partial night and therefore not counted. They assumed since it was the day before the Sabbath, it meant Friday. Here is where our background on the Sabbath sheds some light. We know that since the crucifixion was on the Passover, it was automatically the day before a Sabbath, no matter what day it was on, because the high Sabbath day of the Feast of Unleavened Bread was the next day (Again, no matter what day Passover was on, the next day was automatically a Sabbath). 1. When the Holy Spirit inspired the writing of the Bible (66 books, written by 40 authors over 2000 years), He wove various clues into the text in order for us to verify the authenticity of the Bible. As we see prophecy come to pass we gain more respect for the Word because only the God who knows the end from the beginning could predict with 100% accuracy. God's plan for redemption is the message of the Scriptures, it is the gospel, or "good news." There are proclamations or subtle clues on literally every page. The Feasts were not only historic (i.e., to be celebrated once they left Egypt and settled into the Promised Land of Israel), but also prophetic, pointing to the Savior (read Hebrews 8:1-10:39). It is no coincidence that Jesus was crucified on Passover, the same day God saved the Hebrews from the death in Egypt by placing blood of a lamb on the door posts and door jambs (making a cross). It is no coincidence that Jesus arose from the dead on the feast of First Fruits. It is no coincidence that the Church was officially given the power of the Holy Spirit to proclaim the Gospel on the Feast of Pentecost. There are many other accounts in the scripture that point specifically to Christ's redemption of mankind. Let's go back to Genesis and visit Noah. It is generally held that the ark is a "type" of Jesus. The ark saved Noah and his family from the wrath of God's judgment upon the evil world. Jesus offers salvation to all those who trust in Him, sparing them from judgment for their sins. The ark rested, or finished the work of saving Noah's family on a significant day. God instituted a calendar change explained in Exodus, and the seventh month became the first month. It turns out that the same day the ark rested is the 17th day of Nisan, which just happens to be three days and three nights after the 14th of Nisan (the future Passover feast). So that would mean that in prophetic illustration, God caused the ark to rest from the flood (His wrath on an evil world) on the same day that Jesus would rise from the dead to save mankind from the future wrath upon a Christ rejecting world. Coincidence? Highly unlikely. Note that for this to be a true prophetic model, the only day of the week that works for a Sunday resurrection on the 17th of Nisan, is a Thursday crucifixion on the 14th day of Nisan. 2. The last argument for a Thursday crucifixion comes from the actions of Mary Magdalene. Why did Mary wait until Sunday to go to the tomb with the ministering oils and herbs? If the crucifixion took place on Wednesday, then Thursday would have been the high Sabbath, making it impossible for her to go to the tomb on that day, but Friday would have been a normal day, with no restrictions. If on the other hand Thursday was the day of the crucifixion, then Friday would have been the high Sabbath, and Saturday would have been the weekly Sabbath (making it impossible for her to go on Friday or Saturday), leaving Sunday as the first "legal" day she could have made the trip. With all of that said, it must be noted that the day of the week is not something we know from scripture. If God wanted us to know whether it was Wednesday, Thursday or Friday, it would have been clearly stated. What we do know is that it occurred on Passover as a model of the sacrifice of the perfect Lamb, and that He rose again on the Feast of First Fruits, since He is the first fruit of the resurrection. It is fine to hold a personal view but unwise to become dogmatic about it. We should celebrate the cross and the resurrection every day of our earthly visit. The observances of Good Friday and Easter Sunday have perpetuated the traditional chronology that the crucifixion took place on a Friday, and that the Lord's body was buried on that day at about 6:00 p.m., and that he rose from the dead early on the following Sunday morning. There are some, however, that feel this tradition is at variance with the Scriptural record. The traditional view seems to conflict with certain prophetic and legal facts. One of the problems is reckoning "three days" between Friday evening and Sunday morning. The mention of nights, as well as the number of days, makes it hard to render this as simply an idiomatic rhetorical device rather than a statement of fact. Further, when Paul declares the resurrection of Christ to be "according to the Scriptures" in 1 Corinthians 15:4, if this isn't an allusion to Jonah 1:17, then where else? (Perhaps, in Genesis 22, the three days between the "death" of Isaac - when the commandment came - and his "return" to Abraham may have been the macrocode, or typological allusion, that Paul might have had in mind. Intensifying this controversy was the "three days" issue at the trial of Jesus. Nowhere in the Gospels does it assert that Christ was crucified on a Friday. In Mark 15:42, it refers to "...the day before the Sabbath." This may be the root of the misunderstanding. 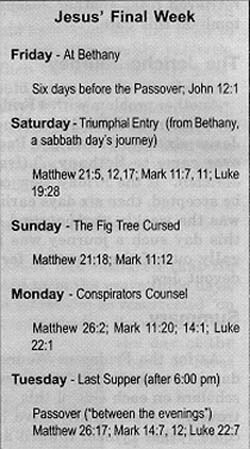 Further, Matthew 28:1 should read, "At the end of the Sabbaths ," (5) (which is plural in the Greek), implying there was a plurality of Sabbaths that week. Noah's flood ended on the 17th day of the 7th month. (8) This month becomes the 1st month at the institution of the Passover.9 Our new beginning in Christ was on the anniversary of the Earth's "new beginning" under Noah! Israel's new beginning, the crossing of the Red Sea, is believed to have been on the 17th of Nisan. Also, in their flight after Passover, Israel retrieved the body of Joseph from his tomb. After Passover, Jesus was retrieved from another Joseph's tomb on this date. Another problem with a Friday crucifixion is John 12:1: "Then Jesus six days before the Passover came to Bethany..." (from Jericho). If the Friday view can be accepted, then six days earlier was the weekly shabbat , and on this day such a journey was legally out of the question for a devout Jew. As for the Friday or Wednesday issue, there are many good scholars on each side of this controversy. I personally have become rather cynical toward any tradition that is not supported by Scripture. Good Friday is the "traditional" view. The Wednesday crucifixion is known as the "reconstructed view." This article is intended to stimulate study and constructive conversation during this precious season. One attempt to reconcile the chronology of the entire week is shown in the inset boxes [Friday-Tuesday] and [Wednesday-Sunday]. The important thing is that the tomb was empty . The authorities made sure that this was indisputable. Indeed, He is risen! The most important chapter in the Bible is 1 Corinthians 15. Does the fact that all four Gospels contain different versions of the inscription on the Cross indicate error? By no means. Both Luke and John tell us that the inscription on the Cross of Jesus was written in three languages, Greek, Latin and Hebrew. It is therefore a reasonable assumption that three of the Gospel writers each chose to quote a different language, and that one writer chose to quote the words common to the other three. Can this assumption be justified? If so, can it be said with any certainty who chose to quote what? Let us begin with the way each writer prefaces the inscription (s). Matthew 27:37 says, 'And [they] set up over his head his accusation written'. Mark 15:26 says, 'And the superscription of his accusation was written over'. Luke 23:38 says, 'And a superscription also was written over him in letters of Greek, and Latin, and Hebrew'. John 19:19 says, 'And Pilate wrote a title, and put it on the cross'. Notice that all these prefaces differ. Mark tells us that a superscription was written; Matthew, that it was set up over his head; Luke, that it was written in three languages; and John, that Pilate was the writer. All these statements are correct, even though each writer says something different! It was the custom of the Romans to use gypsum letters written on a rough board affixed to a cross to proclaim the reason why a person was being executed, although three languages were not always used. Latin was the official language of the Roman Empire; it represented human government, power, and conquest. Greek was the international language of culture; it represented human wisdom, art, and commerce. Hebrew was the religious language of the Jews; it represented the Covenant Race, the Law of God, and the means by which God made Himself known to man. In the providence of God, all of these human and divine institutions were addressed when Jesus was crucified. How did this come about? The most probable scenario is that the Roman governor, Pilate, dictated the title in Latin and the centurion in charge of the execution implemented the edict and its translation into the other languages. The words 'King of the Jews' were a public sneer at the Jews by Pilate, and this was compounded by his additional taunt that their 'king' came from Nazareth, i.e. that he was a despised Galilean. (Latin used 'I' and 'V' where English uses 'J' and 'U'.) That this is the Latin is further confirmed by the fact that the Early Church adopted as a symbol the Latin letters 'INRI', which are the first letters of this inscription (only), and this symbol appears in many early paintings of the crucifixion. Matthew wrote for the Jews and used many quotations from the Old Testament to show that Jesus was the fulfillment of Old Testament prophecies concerning the Messiah. It is therefore most likely that Matthew quotes the Hebrew inscription (see drawing below). This leaves Mark, whose Gospel is shorter than the other three, and who gives us a somewhat abbreviated account of the life of Jesus, as his purpose is to tell us more about what Jesus did than what Jesus said. For example, he omits the birth of Jesus, as well as the whole of the sermon on the mount and several other discourses. True to his style, Mark abbreviates the inscription to the words common to the three languages used, namely 'THE KING OF THE JEWS'. Now comes the most interesting part! The Latin title, being the official indictment, would undoubtedly have been written first on the board. This then would have determined the length of the board and/or the size of the letters required to fit the inscription into one line and for it still to be readable by the crowd from a distance (John 19:20). In those days they did not use spaces between the words in any of the languages as we do now, and so John's Latin 'title' contained just 26 letters and no spaces. Luke's Greek 'superscription' contained 30 letters, and so must have been written in slightly smaller letters than was the Latin. It is easy to see that there would not have been room for 16 more letters for the words 'Jesus of Nazareth' (i.e. 'Jesus the Nazarene') in Greek. Matthew's 'accusation' in Hebrew contained just 19 letters, which is rather fewer than the two other languages, because the Jews did not write vowels in Hebrew. Whoever translated the title into Hebrew apparently did not think it worth adding 'of Nazareth'. Perhaps he thought that to have lived in Nazareth was not an indictable offense! If we put all of this together, it is highly probable that the board with the inscriptions looked as shown below, with the Latin written first, probably at the top, and then either the Greek or the Hebrew. During the Passover service we proclaim the death of Jesus. If we are going to be proclaiming His death, it's important that we know something about that death. In this article we will examine the final hours of Jesus Christ, His suffering and death. Pilate tries to find a way to release Jesus. "Now at the feast the governor was accustomed to releasing to the multitude one prisoner whom they wished. And at that time they had a notorious prisoner called Barabbas. Therefore, when they had gathered together, Pilate said to them, Whom do you want me to release to you? Barabbas, or Jesus who is called Christ? For he knew that they had handed Him over because of envy. While he was sitting on the judgment seat, his wife sent to him, saying, Have nothing to do with that just Man, for I have suffered many things today in a dream because of Him. But the chief priests and elders persuaded the multitudes that they should ask for Barabbas and destroy Jesus. The governor answered and said to them, Which of the two do you want me to release to you? They said, Barabbas! Pilate said to them, What then shall I do with Jesus who is called Christ? They all said to him, Let Him be crucified! Then the governor said, Why, what evil has He done? But they cried out all the more, saying, Let Him be crucified! When Pilate saw that he could not prevail at all, but rather that a tumult was rising, he took water and washed his hands before the multitude, saying, I am innocent of the blood of this just Person. You see to it. And all the people answered and said, His blood be on us and on our children" (Matthew 27:15-25). In the early morning, battered and bruised, dehydrated, and exhausted from a sleepless night, Jesus is taken across the Praetorium of the Fortress Antonia, the seat of government of the Procurator of Judea, Pontius Pilate. You are, of course, familiar with Pilate's action in attempting to pass responsibility to Herod Antipas, the Tetrarch of Judea. Jesus apparently suffered no physical mistreatment at the hands of Herod and was returned to Pilate. It was in response to the cries of the mob, that Pilate ordered Bar-Abbas released and condemned Jesus to scourging and crucifixion. "Then he released Barabbas to them; and when he had scourged Jesus, he delivered Him to be crucified. Then the soldiers of the governor took Jesus into the Praetorium and gathered the whole garrison around Him. And they stripped Him and put a scarlet robe on Him. When they had twisted a crown of thorns, they put it on His head, and a reed in His right hand. And they bowed the knee before Him and mocked Him, saying, Hail, King of the Jews! Then they spat on Him, and took the reed and struck Him on the head. And when they had mocked Him, they took the robe off Him, put His own clothes on Him, and led Him away to be crucified" (Matthew 27:26-31). Preparations for the scourging were carried out when the Prisoner was stripped of His clothing and His hands tied to a post above His head. It is doubtful the Romans would have made any attempt to follow the Jewish law in this matter, but the Jews had an ancient law prohibiting more than forty lashes. The Roman legionnaire steps forward with the flagrum (or flagellum) in his hand. This is a short whip consisting of several heavy, leather thongs with two small balls of lead attached near the ends of each. The heavy whip is brought down with full force again and again across Jesus' shoulders, back, and legs. At first the thongs cut through the skin only. Then, as the blows continue, they cut deeper into the subcutaneous tissues, producing first an oozing of blood from the capillaries and veins of the skin, and finally spurting arterial bleeding from vessels in the underlying muscles. The small balls of lead first produce large, deep bruises which are broken open by subsequent blows. Finally the skin of the back is hanging in long ribbons and the entire area is an unrecognizable mass of torn, bleeding tissue. When it is determined by the centurion in charge that the prisoner is near death, the beating is finally stopped. The half-fainting Jesus is then untied and allowed to slump to the stone pavement, wet with His own blood. The Roman soldiers see a great joke in this provincial Jew claiming to be king. They throw a robe across His shoulders and place a stick in His hand for a scepter. They still need a crown to make their travesty complete. Flexible branches covered with long thorns (commonly used in bundles for firewood) are plaited into the shape of a crown and this is pressed into His scalp. Again there is copious bleeding, the scalp being one of the most vascular areas of the body. After mocking Him and striking Him across the face, the soldiers take the stick from His hand and strike Him across the head, driving the thorns deeper into His scalp. Finally, they tire of their sadistic sport and the robe is torn from His back. Already having adhered to the clots of blood and serum in the wounds, its removal causes excruciating pain just as in the careless removal of a surgical bandage, and almost as though He were again being whipped the wounds once more begin to bleed. Pilate Has Doubts About Crucifying Jesus. Jesus Lead Away to be Crucified. "Then he delivered Him to them to be crucified. So they took Jesus and led Him away. And He, bearing His cross, went out to a place called the Place of a Skull, which is called in Hebrew, Golgotha, where they crucified Him, and two others with Him, one on either side, and Jesus in the center" (John19:16-18). "Now as they led Him away, they laid hold of a certain man, Simon a Cyrenian, who was coming from the country, and on him they laid the cross that he might bear it after Jesus. And a great multitude of the people followed Him, and women who also mourned and lamented Him. But Jesus, turning to them, said, Daughters of Jerusalem, do not weep for Me, but weep for yourselves and for your children. For indeed the days are coming in which they will say, Blessed are the barren, wombs that never bore, and breasts which never nursed! Then they will begin to say to the mountains, Fall on us! and to the hills, Cover us! For if they do these things in the green wood, what will be done in the dry? There were also two others, criminals, led with Him to be put to death. And when they had come to the place called Calvary, there they crucified Him, and the criminals, one on the right hand and the other on the left" (Luke 23:26-33). "And when they had mocked Him, they took the robe off Him, put His own clothes on Him, and led Him away to be crucified. Now as they came out, they found a man of Cyrene, Simon byname. Him they compelled to bear His cross. And when they had come to a place called Golgotha, that is to say, Place of a Skull" (Matthew 27:31-33). In deference to Jewish custom, the Romans return His garments. The heavy patibulum of the cross is tied across His shoulders, and the procession of the condemned Christ, two thieves, and the execution detail of Roman soldiers headed by a centurion begins its slow journey along the Via Dolorosa. In spite of His efforts to walk erect, the weight of the heavy wooden beam, together with the shock produced by copious blood loss, is too much. He stumbles and falls. The rough wood of the beam gouges into the lacerated skin and muscles of the shoulders. He tries to rise, but human muscles have been pushed beyond their endurance. The centurion, anxious to get on with the crucifixion, selects a stalwart North African onlooker, Simon of Cyrene, to carry the cross. Jesus follows, still bleeding and sweating the cold, clammy sweat of shock, until the 650 yard journey from the fortress Antonia to Golgotha is finally completed. Jesus is offered wine mixed with myrrh, a mild analgesic mixture. He refuses to drink. Simon is ordered to place the patibulum on the ground and Jesus quickly thrown backward with His shoulders against the wood. The legionnaire feels for the depression at the front of the wrist. He drives a heavy, square, wrought-iron nail through the wrist and deep into the wood. Quickly, he moves to the other side and repeats the action being careful not to pull the arms to tightly, but to allow some flexion and movement. The patibulum is then lifted in place at the top of the stipes and the titulus reading "Jesus of Nazareth, King of the Jews" is nailed in place. Soldiers Cast Lots for Jesus' Garments. "Then they crucified Him, and divided His garments, casting lots, that it might be fulfilled which was spoken by the prophet: They divided My garments among them, And for My clothing they cast lots. Sitting down, they kept watch over Him there. And they put up over His head the accusation written against Him: THIS IS JESUS THE KING OF THE JEWS" (Matthew 27:35-37). "And when they crucified Him, they divided His garments, casting lots for them to determine what every man should take. Now it was the third hour, and they crucified Him" (Mark15: 24-25). The people, priests and thieves mock Jesus. John's Description of the Crucifixion. "Where they crucified Him, and two others with Him, one on either side, and Jesus in the center. Now Pilate wrote a title and put it on the cross. And the writing was: JESUS OF NAZARETH, THE KING OF THE JEWS. Then many of the Jews read this title, for the place where Jesus was crucified was near the city; and it was written in Hebrew, Greek, and Latin. Therefore the chief priests of the Jews said to Pilate, Do not write, The King of the Jews, but, He said, I am the King of the Jews. Pilate answered, What I have written, I have written. Then the soldiers, when they had crucified Jesus, took His garments and made four parts, to each soldier a part, and also the tunic. Now the tunic was without seam, woven from the top in one piece. They said therefore among themselves, Let us not tear it, but cast lots for it, whose it shall be, that the Scripture might be fulfilled which says: They divided My garments among them, And for My clothing they cast lots. Therefore the soldiers did these things. Now there stood by the cross of Jesus His mother, and His mother's sister, Mary the wife of Clopas, and Mary Magdalene. When Jesus therefore saw His mother, and the disciple whom He loved standing by, He said to His mother, Woman, behold your son! Then He said to the disciple, Behold your mother! And from that hour that disciple took her to his own home" (John 19:18-27). [In the first of the seven sentences, Jesus says,] looking down at the Roman soldiers throwing dice for His seamless garment, "Father, forgive them for they know not what they do." The second, to the penitent thief, "Today you shall be with me in Paradise." The third, looking down at the terrified, grief-stricken adolescent John -- the beloved Apostle – he said, "Behold thy mother." Then, looking to His mother Mary, "Woman behold thy son." The fourth cry is from the beginning of the 22nd Psalm, "My God, my God, why has thou forsaken me?" Hours of limitless pain, cycles of twisting, joint-rending cramps, intermittent partial asphyxiation, searing pain where tissue is torn from His lacerated back as He moves up and down against the rough timber. Then another agony begins. . . A terrible crushing pain deep in the chest as the pericardium slowly fills with serum and begins to compress the heart. One remembers again the 22nd Psalm, the 14th verse: "I am poured out like water, and all my bones are out of joint; my heart is like wax; it is melted in the midst of my bowels." "Now it was about the sixth hour, and there was darkness over all the earth until the ninth hour. Then the sun was darkened, and the veil of the temple was torn in two. And when Jesus had cried out with a loud voice, He said, Father, into Your hands I commit My spirit. Having said this, He breathed His last" (Luke 23:44-46). "After this, Jesus, knowing that all things were now accomplished, that the Scripture might be fulfilled, said, I thirst! Now a vessel full of sour wine was sitting there; and they filled a sponge with sour wine, put it on hyssop, and put it to His mouth. So when Jesus had received the sour wine, He said, It is finished! And bowing His head, He gave up His spirit" (John19:28-30). Jesus gasps His fifth cry, "I thirst." One remembers another verse from the prophetic 22nd Psalm: "My strength is dried up like a potsherd; and my tongue cleaveth to my jaws; and thou has brought me into the dust of death." A sponge soaked in posca, the cheap, sour wine which is the staple drink of the Roman legionnaires, is lifted to His lips. He apparently doesn't take any of the liquid. The body of Jesus is now in extremis, and He can feel the chill of death creeping through His tissues. This realization brings out His sixth words, possibly little more than a tortured whisper, "It is finished." His mission of atonement has completed. Finally He can allow his body to die. With one last surge of strength, he once again presses His torn feet against the nail, straightens His legs, takes a deeper breath, and utters His seventh and last cry, "Father! Into thy hands I commit my spirit." "One of them ran off at once and took a sponge, which he soaked in vinegar and put on the end of a stick, to give him a drink. But the others said, Stop, let us see if Elijah does come to save him! (Seizing a lance, another pricked his side, and out came water and blood.) Jesus again uttered a loud scream, and gave up his spirit" (Matthew 27:48-50). An earthquake opens the graves and a physical resurrection of some saints. "Then, behold, the veil of the temple was torn in two from top to bottom; and the earth quaked, and the rocks were split, and the graves were opened; and many bodies of the saints who had fallen asleep were raised; and coming out of the graves after His resurrection, they went into the holy city and appeared to many" (Matthew 27:51-53). A Centurion acknowledges Jesus as the Son of God. "Therefore, because it was the Preparation Day, that the bodies should not remain on the cross on the Sabbath (for that Sabbath was a high day), the Jews asked Pilate that their legs might be broken, and that they might be taken away. Then the soldiers came and broke the legs of the first and of the other who was crucified with Him. But when they came to Jesus and saw that He was already dead, they did not break His legs. But one of the soldiers pierced His side with a spear, and immediately blood and water came out. And he who has seen has testified, and his testimony is true; and he knows that he is telling the truth, so that you may believe. For these things were done that the Scripture should be fulfilled, Not one of His bones shall be broken. And again another Scripture says, They shall look on Him whom they pierced. After this, Joseph of Arimathea, being a disciple of Jesus, but secretly, for fear of the Jews, asked Pilate that he might take away the body of Jesus; and Pilate gave him permission. So he came and took the body of Jesus. And Nicodemus, who at first came to Jesus by night, also came, bringing a mixture of myrrh and aloes, about a hundred pounds. Then they took the body of Jesus, and bound it in strips of linen with the spices, as the custom of the Jews is to bury. Now in the place where He was crucified there was a garden, and in the garden a new tomb in which no one had yet been laid. So there they laid Jesus, because of the Jews' Preparation Day, for the tomb was nearby" (John 19:31-42). "For I received from the Lord that which I also delivered to you: that the Lord Jesus on the same night in which He was betrayed took bread; and when He had given thanks, He broke it and said, Take, eat; this is My body which is broken for you; do this in remembrance of Me. In the same manner He also took the cup after supper, saying, This cup is the new covenant in My blood. This do, as often as you drink it, in remembrance of Me. For as often as you eat this bread and drink this cup, you proclaim the Lord's death till He comes" (1 Corinthians 11:23-26). The crucifixion and resurrection of Christ is perhaps the most important single event in human history and the most misunderstood. The traditions associated with the crucifixion assert that Christ was crucified on a cross. This is translated from the Latin word crux. The origin and significance of the cross is dealt with in the paper The Cross: Its Origins and Significance (No. 39)). The Companion Bible at Appendix 162 deals with the two words translated as cross from the Greek NT. The words are stauros and xulon. The Companion Bible notes that the Greek word stauros denotes an upright pale or stake, to which the criminals were nailed for execution. The word xulon denotes a piece of dead log or wood, or timber for fuel or any other purpose. It is not like dendron which is used of a living or green tree (as in Matthew 21:8; Rev. 7:1,3; 8:7; 9:4 etc.). The Appendix states that: As this latter word xulon is used for the former stauros, it shows us that the meaning of each is exactly the same. Our English word "cross" is the translation of the Latin crux; but the Greek stauros no more means a cross than the word "stick" means a "crutch." Homer uses the word stauros of an ordinary pole or stake, or single piece of timber. And this is the meaning and usage of the word throughout the Greek classics. It never means two pieces of timber placed across one another at any angle, but always of one piece alone. Hence the use of the word xulon (no 2 above) in connection with the manner of our Lord’s death, and rendered tree in Acts 5:30; 10:39; 13:29; Gal. 3:13; 1Pet. 2:24. This is preserved in our old Eng. name rood or rod. There is nothing in the Greek of the N. T. even to imply two pieces of timber. The letter chi, X, the initial of the word Christ [Christos] was originally used for His name; or Xp. This was superseded by the symbols and , and even the first of these had four equal arms. These crosses were used as symbols of the Babylonian sun god, , and are first seen on a coin of Julius Caesar, 100-44 BC and then on a coin struck by Caesar’s heir (Augustus), 20 BC ... The first confusion of the matter of the crucifixion is perhaps more clear. Christ was crucified on a stauros or stake, not a cross. He was crucified on the 14th of Nisan sometime in the reign of Tiberius Caesar. The identification of the day of the week will depend on the year in which he was killed and the sequence of events of the week as herein. The Passover rotates depending upon the New Moon and not on the day of the week. There are a number of Scriptures that determine the exact time and there are a number of prophecies that have to be fulfilled in order for Jesus, or more correctly Jehoshua, to be the Messiah. The way of determining the year in which the crucifixion fell is to commence with the known dates of Scripture. The only certain date we have is from the ministry of John the Baptist. Luke 3:1-6:1 Now in the fifteenth year of the reign of Tiberius Caesar, Pontius Pilate being governor of Judaea, and Herod being tetrarch of Galilee, and his brother Philip tetrarch of Ituraea and of the region of Trachonitis, and Lysanias the tetrarch of Abilene, 2 Annas and Caiaphas being the high priests, the word of God came unto John the son of Zacharias in the wilderness. 3 And he came into all the country about Jordan, preaching the baptism of repentance for the remission of sins; 4 As it is written in the book of the words of Esaias the prophet, saying, The voice of one crying in the wilderness, Prepare ye the way of the Lord, make his paths straight. 5 Every valley shall be filled, and every mountain and hill shall be brought low; and the crooked shall be made straight, and the rough ways shall be made smooth; 6 And all flesh shall see the salvation of God. The preamble in Luke 3:1 here gives an exact date for the commencement of the ministry of John the Baptist. By establishing his ministry, Scripture then supplies the clues that allows us to establish with absolute certainty the commencement and duration of the ministry of Jesus Christ. Tiberius Claudius Caesar Augustus, the successor to the Roman Emperor Augustus, was born in 42 BCE to noble parents who were divorced so that Livia, his mother, could marry Octavian (Augustus). Augustus had forced him to divorce his wife so that he could marry the emperor’s daughter, Julia, in order to produce an heir to the throne. Julia was banished in 2 BC for scandalous behaviour, and, due to the death of her two sons from a previous marriage, Tiberius had to be adopted by Augustus as his heir in 4 CE. The Senate gave him Tribunician power and proconsular authority. When Augustus died, the Senate named Tiberius emperor on 17 September 14 CE Augustus reigned until 19 August 14 CE. The sacred year of Israel began in Nisan, but the civil year in the east began in approximately October, the Month of Beginnings or Tishri. The New Moons of 14 CE began in Jerusalem on Thursday 13 September 14 CE at 04:31 hrs and Friday 12 October 14 CE at 19:47 hrs (determined from H. H. Goldstine New and Full Moons 1001 BC to 1651 CE, American Philosophical Society, 1973). Tishri might thus begin on 13 October or the fifteenth year of Tiberius was in 28 CE. Depending upon the method of calculation, it is impossible for 1 Tishri to be more than 177 days from 1 Nisan under the postponement system or perhaps less (to 173) by observed months. From 13 October, 1 Nisan would fall on approximately 26 April. This is more than 30 days from the equinox, which occurs in these Julian dates on 20-21 March. This date is thus impossible. It can be deduced that 1 Tishri thus fell on 13 September 14 CE. The second year of Tiberius had to begin in October 14 CE for the fifteenth year of Tiberius to be assumed to have begun in Tishri of 27 CE if the proclamation date is assumed. Pontius Pilate held office for 10 years (A of J, xviii, 4, 2) from 26 CE to 36 CE when he was deposed shortly before Vitellius’ visit to Jerusalem, shortly before Passover of 36 CE. Josephus dates Pilate’s assumption to the twelfth year of Tiberius, which is held as 25-26 CE (Schurer, p. 382, fn. 130). This rests only on the statement of Josephus. 27-28 CE is thus the fourteenth year according to Josephus. This matter, introduces an apparent contradiction to the biblical text, which can be reconciled if it is assumed that Josephus is working from the date of his appointment by the Senate, and Luke is working from the death of Augustus. Another aspect needs to be considered also. The Macedonian names for the months were adopted in Syria from the Seleucid dominion, and the confusion with the Julian Calendar had the year begin on different days in some large cities. In Tyre the year began on 18 November, in Gaza and Ascalon on 29 August (Bickerman Chronology) and the Julian months were later simply called by the Macedonian names (Ideler I, pp. 429 ff). There is thus some dispute as to whether Josephus was referring to the Jewish month by the Macedonian name or, in fact, the Macedonian/Julian. This question and the Jewish Calendar used is examined by Schurer (ibid., Vol. I, pp. 595-599). Schurer discounts the contention that the Tyrian Calendar was used by the Jews (ibid., p. 599). John the Baptist’s ministry would also have coincided with the month of the blowing of the Jubilee, as 27 CE was a Jubilee year and Atonement on 10 Tishri was the time that it was blown. John could not have commenced his ministry before Tishri 27 CE as the fifteenth year of Tiberius commenced in that month, at the earliest, counting from the death of Augustus. A noteworthy observation from the construction of the calendar in the Book of Jubilees, based on the 364-day year of exactly 52 weeks, placed the Passover on a Wednesday every year with Atonement on a Friday and Tabernacles commenced on a Wednesday. There is general agreement among authorities that the Qumran community deprecated the use of the luni-solar calendar and adopted the calendar similar to or identical with that used in the Book of Jubilees (Schurer, ibid., pp. 600-601). It can thus be assumed that Qumran held a Passover on a Wednesday, which coincided with the general community only in a few years over that period. The placement of the Passover on a Wednesday in 31 CE has been generally accepted by the Churches of God in the twentieth century. Fred Coulter Harmony of the Gospels, appears to place it on a Wednesday in 30 CE as well as in 31 CE. However, Daniel-Rops Jesus and His Times, tr. Ruby Millar, Dutton & Co, New York, 1954, places the crucifixion on 7 April 30 CE which is claimed to be a Friday (p. 432). Fred Coulter is grossly in error and perhaps even contrived in his understanding and arguments about the Passover in his work, The Christian Passover, York Publishing Co, CA, 1993. However, it appears to be that Daniel-Rops constructs this Friday argument from a desire to have the crucifixion on a Friday and the sequence of events is re-constructed accordingly. Palm Sunday is inexplicably distanced and the historical comments and comparison between the routes used by Christ and the modern city are fanciful. The entire argument is constructed around the premise that Friday was the day of crucifixion rather than constructing a table of events, which shows the sequence of activity from the entry to Bethany around the preceding Sabbath. No explanation is offered for the Holy Day. Moreover, the Passover is determined from the New Moon which, as we will see, in 30 CE absolutely precludes a Friday crucifixion. It is important for the Orthodox Church to establish 30 CE as a Friday Passover as we will see that the sequence of the Passovers in John from the fifteenth year of Tiberius indicates a 30 CE crucifixion, given the Passover narrative in John 11:55 and John 12:1. The timing of the Passover either in 30 CE or 31 CE has great significance for the Sign of Jonah. Daniel-Rops intuitively understands this point when he observes that: Forty years later, at the beginning of the month of Nisan, in the year 70, a Roman army invested the Holy City. Four legions of Syrian and Numidian auxiliaries, sixty thousand men with the finest material equipment, were led by the Emperor Titus, the son of Vespasian, who had been proclaimed only six months earlier by a coup d’etat of the legions in Egypt (ibid., p. 452). Thus, if the gospel of John refers to only one Passover in chapters 11 & 12, which is almost certain, and the commencement of the narrative is at the Passover of 28 CE, we have a 30 CE Passover. Thus the Orthodox must fabricate the Friday crucifixion, and the Sign of Jonah commences in 30 CE and finishes at 1 Nisan 70 CE. The subsequent destruction of the Temple and the closure of the Temple at Leontopolis in Egypt, is just narrative from the commencement of the closure. If it is in 31 CE the closure of the Sign is with the cessation of sacrifice. Let us examine the options. A necessary step is to establish the dates of the New Moons at Jerusalem over the period of 28-33 CE in order to examine when the dates of 1 Nisan and, thence, the Passover occurs in those years. It is then possible to ascertain quite accurately when a Wednesday or Friday crucifixion is possible, and whether such a view coincides with the biblical texts. Her Majesty’s Nautical Almanac Office has supplied the dates on which the New Moons fell in the years 28-33 CE The times are supplied from observation at Babylon (Baghdad) and thus 37 minutes must be deducted from the times to get Jerusalem civil time. Irregularities in the earth’s rotation give rise to small irregularities in times. The equinox is also earlier from the Julian dates, i.e. 20-21 March. The equinox can be as early as 20 March in the Gregorian system also. Thursday 19 March 33 CE These postponements were not according to the Hillel or later systems, but were ad hoc decisions (see the paper God’s Calendar (No. 156)). Friday 3 April 33 CE (postponed as described in previous paragraph) Except for 33 CE, it is impossible for the crucifixion to have been on a Friday. The date in 30 CE is clearly a Wednesday. The date in 31 CE is a Sunday. Thus, 31 CE appears ruled out by the advocates of a Wednesday crucifixion. How might 31 CE be accommodated? The argument is made that the sacred year in 31 CE did not begin until Wednesday 11 April 31 CE according to the rules of postponement now extant. However, that still only places the crucifixion on a Tuesday, namely 24 April. Aside from this fact there are a number of other problems with this date. From the ancient system of observation which was observed by both Orthodox Christians and Jews prior to the Hillel calendar’s introduction in 344-358 CE, the latest possible date for 1 Nisan is the Gregorian 7 April (or earlier with the Julian date). The nearest New Moon to the equinox and the Passover after the equinox, makes a latest possible date of 7 April (Gregorian). The postponements have seen dates as late as 8 April for 1 Nisan (e.g. 1997 Jewish Calendar), but this rests on no biblical authority and no evidence prior to 344 CE. The Passover cannot fall later than 22-23 April in any year. Under the Julian system the dates are earlier. Thus 25 April 31 CE appears to be a complete fiction. Why was this fiction introduced? The answer appears to lie in the false assumptions behind the theological speculation regarding the seventy weeks of years ending with Messiah. This is based upon the mistranslation of Daniel 9:25 in the KJV. The commencement date for the prophecy is taken from the reign of Artaxerxes I and the sixty nine weeks are then ended in 27 CE, which is then claimed as the beginning of Christ’s ministry. He is then claimed to have preached for three and one half years. The week is then split and another period is claimed for the end normally being attributed to the witnesses or such like. The argument is totally contrived and rests on no biblical evidence. H. Hoeh uses this flawed theology as his base in the work The Crucifixion Was Not on Friday (Ambassador College Press, 1959, 1961, 1968). While that title is a true statement, the arguments produced by Hoeh and those such as Coulter, to support this position are not true. The alternatives are thus Wednesday 5 April 30 CE, Sunday 25 March 31 CE, Sunday 13 April 32 CE, and Friday 3 April 33 CE. We can now test what appears to be the year of the crucifixion Passover, based upon the biblical evidence and historical evidence. We know that Christ did not commence his ministry until after John had been put in prison (Mat. 4:12-17; Mk. 1:14). Matthew 4:12-17 12 Now when Jesus had heard that John was cast into prison, he departed into Galilee; 13 And leaving Nazareth, he came and dwelt in Capernaum, which is upon the sea coast, in the borders of Zabulon and Nephthalim: 14 That it might be fulfilled which was spoken by Esaias the prophet, saying, 15 The land of Zabulon, and the land of Nephthalim, by the way of the sea, beyond Jordan, Galilee of the Gentiles; 16 The people which sat in darkness saw great light; and to them which sat in the region and shadow of death light is sprung up. 17 From that time Jesus began to preach, and to say, Repent: for the kingdom of heaven is at hand. We know from John’s gospel that John was not imprisoned until after the Passover which appears to be that of 28 CE, being the first mentioned and following John’s commencement of his ministry as outlined. The Passover is mentioned at John 2:13,23. John the Baptist was baptising in Aenon near Salim. Jesus had come into Galilee with his disciples who were baptising, although he himself did not baptise (Jn. 4:2). John had not yet been cast into prison. John 3:22-24 22 After these things came Jesus and his disciples into the land of Judaea; and there he tarried with them, and baptized. 23 And John also was baptizing in Aenon near to Salim, because there was much water there: and they came, and were baptized. 24 For John was not yet cast into prison. We know that Christ was conscious that his ministry had not yet come because he made that point to the woman at the marriage in Cana (John 2:4). From a reconstruction of the timings of the events, we can deduce with some certainty that Christ was baptised around February some 50 days prior to the Passover. The Synoptic gospels do not bear witness to the full number of Passovers concerned. John, however, lists the greater number in question. The first Passover which appears to be that of 28 CE is mentioned in John 2:13,23. The next feast mentioned is in John 5:1. The feast is not certain, but it is thought to be perhaps Purim by some (see Comp. Bible, fn. to v. 1). Christ, however, is recorded by John as being in Samaria at the harvest (and perhaps four months from Ingathering) which is approximately at Pentecost of 28 CE (John 4:3-5). The next Passover feast, in what would be 29 CE, is mentioned in John 6:4. John 6:1-4:1 After these things Jesus went over the sea of Galilee, which is the sea of Tiberius. 2 And a great multitude followed him, because they saw his miracles which he did on them that were diseased. 3 And Jesus went up into a mountain, and there he sat with his disciples. 4 And the Passover, a feast of the Jews, was nigh. He taught in Capernaum after this period (John 6:59). There is a feast mentioned in Luke 6:1 when the term second Sabbath after the first is used to translate deuteroprotos or second first Sabbath. This refers to the second Sabbath of a feast from Yom Tov or the first Holy Day. Thus it is either the weekly Sabbath (see fn. to Companion Bible) or the second Holy Day (Friedrich Westburg Die Biblische Chronologie, p. 122 -- see H. Hoeh The Crucifixion Was Not on Friday, 1968 reprint, p. 32). The Companion Bible ties this text to Matthew 12:1 as the weekly Sabbath. This feast is referred to as a Passover by those who seek to establish a fourth Passover, and one distinct from those mentioned in John, in order to establish 31 CE as the year of Christ’s death. The feast of Luke 6:1 at first glance appears to be Tabernacles rather than Passover as the corn is ripe. However, the term corn can refer to barley or wheat and thus refer to the period between March and June and, hence, Passover or Pentecost. The New RSV translates Luke 6:1 as grain fields and not corn fields. If it was Passover and it was the weekly Sabbath, then the Wave Sheaf had not been presented, being presented on the morning after the Sabbath (not the Shabbatown or Holy Day). Remember, Sivan 6 was part of the postponements established under the Hillel system. Christ would not have broken his own injunctions by eating grain before the wave-sheaf was presented (Leviticus 23:14). Barley (and wheat) must be threshed. The reference in Luke 6:1 indicates that the ears of corn were rubbed in the hands before being eaten. Maize (or corn) does not need this action but rather is stripped. Thus, the day appears to be the second Holy Day of the Passover at the earliest. The other possibility is that it was Pentecost Sunday at the wheat harvest. Christ was entitled to glean. This activity preceded the appointment of the twelve apostles (Luke 6:13) and thus was very early. In this instance, it would then appear to be Passover of 28 CE (or 29 CE at the very latest) that is in question. The activities took place on the (coastal) plain prior to Christ’s entry to Capernaum. The Feast of Tabernacles is mentioned at John 7:2. Jesus went up secretly to the feast but then taught at the Temple (John. 7:10,14,37; 8:1-2,20). The Feast of Dedication or Hanukkah is mentioned from John 10:22. The feast is of eight days commencing from the twenty-fifth of the month of Chislev. It is also called the Feast of Lights by Judah. This was winter, two months after the Feast of Tabernacles. The Jewish authorities sought to kill him, but Christ escaped and went beyond Jordan to where John had at first been baptizing (John. 10:39-42). No mention is made of the duration of this time beyond the Jordan. He came back in to raise Lazarus from the dead and went away again to the city of Ephraim where he remained for some time. The next Passover is mentioned at John 11:55. John 11:55-57 55 And the Jews' Passover was nigh at hand: and many went out of the country up to Jerusalem before the Passover, to purify themselves. 56 Then sought they for Jesus, and spoke among themselves, as they stood in the temple, What think ye, that he will not come to the feast? 57 Now both the chief priests and the Pharisees had given a commandment, that, if any man knew where he were, he should show it, that they might take him. From this text we follow on to John 12:1 which deals with the entry to Bethany. Lazarus had been raised from the dead and was at table with them. Jesus had left the Jews and gone to another area in the city of Ephraim after the raising of Lazarus from the dead and continued there with his disciples (John. 11:54). It is assumed that the Passover of John 11:55 is that of John 12:1 and that appears likely from the text. There are thus two Passovers mentioned in Luke and three in John. There seems to be no basis for a fourth Passover, unless it could be established that the feast of Luke 6:1 is a Passover and another and separate Passover to the record of John. The real problem is that the forty days for Jonah was given forty years for Judah from the ministry of Messiah. The ministry of Messiah, on a literal interpretation of John, is just under two years with the ministry of John the Baptist preceding him by six months, which is their age difference (see Luke 1). Thus the combined ministry was less than three years as Jonah’s ministry was less than three days. Thus, Jonah entered a days journey (which corresponded to John’s ministry) and prophesied for two days (which corresponded to Christ’s ministry for two years). The year for a day nexus is still retained. From the reconstruction we thus appear to be faced with a 30 CE Passover date for the crucifixion. While it is difficult to deal with all the activities over this period in one paper, it is nevertheless useful to construct a table of events. This must be done in order to test the biblical chronology against the dates. The next task is to proceed to a harmony of the last days of the Passover period from the entry to Bethany. The Law requires a number of aspects to be observed for the Passover. Christ’s actions prior to the Passover symbolized the requirements of the ordinances concerning the Feast of the Passover and Unleavened Bread. the temporary accommodation is prepared on the thirteenth of Nisan and occupied from the evening commencing the fourteenth of Nisan. The chegigoh meal, or meal of preparation, is eaten on the fourteenth of Nisan. This was the Lord’s Supper. This is a meal of the Passover but is not the Passover meal itself. The Passover lamb is killed on the afternoon of the fourteenth. The Passover is then eaten standing up on the evening commencing the fifteenth of Nisan. On the morning of the day of the fifteenth the people are then allowed to return to their homes (Deuteronomy 16:6). The Feast then continues for seven days, the last of which is a Holy Day. This sequence helps us understand what is happening at the crucifixion Passover. The period of the Feast of Unleavened Bread is an extended period, which covers the preparation days, the Passover proper and the Feast of Unleavened Bread. The first day of Unleavened Bread is actually the preparation day commencing the fourteenth of Nisan. The period in question in Matthew 26:17 was in the preparation period of the thirteenth of Nisan prior to taking up the temporary accommodation for the thirty-six hour period from the evening of the fourteenth of Nisan to the first Holy Day morning (Deuteronomy 16:6). The first activity undertaken by Christ at this final Passover was the cleansing of the Temple. This process was done from the first of Nisan. He had cleansed the Temple previously at the beginning of his ministry as we note from John 2:13-21. There were in fact two entries by Messiah to Jerusalem in this final phase and not one. The first entry mentioned in Matthew 21:1-7 was unexpected and was preliminary to the second expected entry. The sequence is set out to explain the harmony of events undertaken by Christ in order to obey the requirements he had issued to Moses at Sinai as the Angel of the Presence and Elohim of Israel, being anointed to that position by The God Most High who was Yahovah of Hosts, Eloah (Deuteronomy 32:8; Psalms 45:6-7; Hebrews 1:8-9). The priesthood prepare themselves in accordance with the law. Ezekiel 45:18-20 shows the cleansing process. The Tabernacle is cleansed on the first of Nisan. The simple and sinful are cleansed on the seventh day (Ezekiel 45:18-20). The priesthood cleanse themselves for the Passover. It was suspended by Hezekiah because of the failure of the priesthood to sanctify themselves (2Chron. 30:3). We can now deal with the events of the six days before the Passover, from 9 Nisan. We see that the purpose of the first journey to Jerusalem was to cleanse the Temple, which had to be done for the Passover ceremony where Christ was to be the Passover Lamb. The next activities concern the tenth of Nisan which is the setting aside of the lamb for the Passover sacrifice in accordance with Exodus 12:3. This occurred on Friday sunset to Saturday sunset. Christ dedicated himself and was anointed on this Sabbath. The Lord passed the Sabbath at Bethany. The second or triumphal entry to Jerusalem occurs. activities flowed from that event. The tight time frame and comment indicates that the story may have regressed to the previous evening. The narrative in Mark appears to continue the action in a list of activities of the same day. It appears that multiple activities were undertaken for the preparation day and, at the very latest, the meal in Simon’s house had to be the midday meal on 13 Nisan. The Appendix in the Companion Bible regarding the Three Suppers (Appendix 157, p.182) is thus dependent on the regression to the previous evening or be confined to three meals, being two evening meals and one midday meal. In any event, the disciples and Christ had taken up their accommodation by the evening of the fourteenth of Nisan for the last supper. The disciples here prepare to take the Lord’s Supper in temporary accommodation. Deuteronomy 16:5-7 5 Thou may not sacrifice the Passover within any of thy gates, which the LORD thy God give thee: 6 But at the place which the LORD thy God shall choose to place his name in, there thou shall sacrifice the Passover at even, at the going down of the sun, at the season that you come forth out of Egypt. 7 And you shall roast and eat it in the place which the LORD thy God shall choose: and you shall turn in the morning, and go unto thy tents. This then brings us to the close of the thirteenth of Nisan. 14 Nisan (sunset Tuesday to sunset Wednesday). Christ is in the tomb for three days and three nights to fulfill the sign of Jonah (Matthew. 12:39-41). The First Day was the High Day (Yom Tov) the fifteenth day of Nisan, from sunset to sunset. The Second Day was sunset Thursday to sunset Friday which was not a Holy Day and so Mary and the others could get spices to embalm Christ (Mark. 16:1). They then went to the tomb before dawn on the Sunday to embalm him (Mark. 16:2). The Third Day was from sunset Friday to sunset Saturday which was the weekly Sabbath. This ended the third night and the third day in the tomb. This was foretold in Matthew 12:40 and applies to Matthew 27:63 and Mark 8:31. Christ rose on the evening of the fourth day, which was the beginning of the eighteenth of Nisan. He remained overnight in the resurrected state accompanied by angels until the morning. Mary Magdalene spoke to him when she went to the tomb on Sunday morning while it was still dark. In other words, while it was still the previous evening by Judaic reckoning. Matthew 28:1-10 1 In the end of the Sabbath, as it began to dawn toward the first day of the week, came Mary Magdalene and the other Mary to see the sepulcher. 2 And, behold, there was a great earthquake: for the angel of the Lord descended from heaven, and came and rolled back the stone from the door, and sat upon it. 3 His countenance was like lightning, and his raiment white as snow: 4 And for fear of him the keepers did shake, and became as dead men. 5 And the angel answered and said unto the women, Fear not ye: for I know that ye seek Jesus, which was crucified. 6 He is not here: for he is risen, as he said. Come, see the place where the Lord lay. 7 And go quickly, and tell his disciples that he is risen from the dead; and, behold, he goes before you into Galilee; there shall ye see him: lo, I have told you. 8 And they departed quickly from the sepulcher with fear and great joy; and did run to bring his disciples word. 9 And as they went to tell his disciples, behold, Jesus met them, saying, All hail. And they came and held him by the feet, and worshipped him. 10 Then said Jesus unto them, Be not afraid: go tell my brethren that they go into Galilee, and there shall they see me. understood as referring to the plural used in the sense of the complete Sabbath or week of seven days. There is no conflict between Matthew, Mark and John. They must be read in conjunction. It more properly could read: At the end of the week, as it began to dawn into the first day of the week. The text in Matthew 28:1 shows that Christ had risen before the dawn broke. Thus he did not rise on the Sunday. The text in Matthew shows that the Angel rolled the stone away. Christ had already risen. Mary saw that he was gone. She then went to the disciples and returned at dawn. Matthew appears to hold that the two women fell at his feet and laid hold of them. John indicates that he would not allow himself to be touched. John 20:1-17:1 The first day of the week cometh Mary Magdalene early, when it was yet dark, unto the sepulchre, and seeth the stone taken away from the sepulchre. 2 Then she runneth, and cometh to Simon Peter, and to the other disciple, whom Jesus loved, and saith unto them, They have taken away the Lord out of the sepulchre, and we know not where they have laid him. 3 Peter therefore went forth, and that other disciple, and came to the sepulchre. 4 So they ran both together: and the other disciple did outrun Peter, and came first to the sepulchre. 5 And he stooping down, and looking in, saw the linen clothes lying; yet went he not in. 6 Then cometh Simon Peter following him, and went into the sepulchre, and seeth the linen clothes lie, 7 And the napkin, that was about his head, not lying with the linen clothes, but wrapped together in a place by itself. 8 Then went in also that other disciple, which came first to the sepulchre, and he saw, and believed. 9 For as yet they knew not the scripture, that he must rise again from the dead. 10 Then the disciples went away again unto their own home. 11 But Mary stood without at the sepulchre weeping: and as she wept, she stooped down, and looked into the sepulchre, 12 And seeth two angels in white sitting, the one at the head, and the other at the feet, where the body of Jesus had lain. 13 And they say unto her, Woman, why weepest thou? She saith unto them, Because they have taken away my Lord, and I know not where they have laid him. 14 And when she had thus said, she turned herself back, and saw Jesus standing, and knew not that it was Jesus. 15 Jesus saith unto her, Woman, why weepest thou? whom seekest thou? She, supposing him to be the gardener, saith unto him, Sir, if thou have borne him hence, tell me where thou hast laid him, and I will take him away. 16 Jesus saith unto her, Mary. She turned herself, and saith unto him, Rabboni; which is to say, Master. 17 Jesus saith unto her, Touch me not; for I am not yet ascended to my Father: but go to my brethren, and say unto them, I ascend unto my Father, and your Father; and to my God, and your God. The reconciliation of these texts is difficult. The understanding of the resurrection had been given to the women yet appears not to have been conveyed to the apostles. The two women were present but only Mary is mentioned in John. The answer is probably that it was Mary that attempted to seize him and was prevented. The information was conveyed to the apostles but they did not understand the Scriptures that were being fulfilled. Different things are emphasised in each text. What is certain and uniform is that Christ was resurrected well before dawn. The appearance of Christ on the road to Emmaus was three days from the crucifixion and burial (Luke 24:21). This can be reconciled only by counting from Thursday as day 1 in terms of full days. It is translated to include Sunday as the third day and hence commencing Friday. Mark 16:12 gives no time frame. The Greek text is third this day it leads meaning that three full days were past – this being another day (see Marshall’s RSV main text). It is physically impossible for Christ to have been crucified on a Friday and been resurrected on a Sunday and fulfill the sign of Jonah and the Messianic prophecies. He could not have been placed in the tomb until Friday at dark and thus he could only have spent two evenings (one incomplete) and one day in the tomb. The requirement was to spend three days and three nights in the earth. This could only have happened from a Wednesday crucifixion. From the dates this could only have happened in 30 CE. 31 CE has a Sunday crucifixion, 32 CE requires a Saturday and thus a Sunday crucifixion (postponed from the Sabbath). Only 33 CE has a Friday preparation day (postponed from the Thursday) and hence enable a Friday crucifixion. 33 CE is however far too late to be accommodated by the gospels and is completely at odds with the sequence of events in the gospels. Only 30 CE accords with all aspects. It is thus concluded that the crucifixion was on Wednesday 5 April 30 CE. Christ ascended to his Father and our Father and his God and our God (John 20:17), at the time for the Wave Sheaf Offering to be made (Leviticus 23:11) as the first fruits of Israel, which he was. He was the firstborn from the dead. He became a son of God in power through the Holy Spirit by his resurrection from the dead (Romans 1:4). The Wave Sheaf was to be waved the morning after the weekly Sabbath and not the High Day or Shabbathown (see the paper The Wave Sheaf Offering (106b)). The activities, preceding and succeeding the crucifixion and resurrection and its prophesied duration, tie it in to a period that cannot be moved and make the Easter sequence a fiction of pagan idolatry. Christ was crucified on a Wednesday and resurrected on a Saturday evening, from nightfall. The Bible narrative cannot fit any other way and accord with, and fulfill all prophecies and texts.